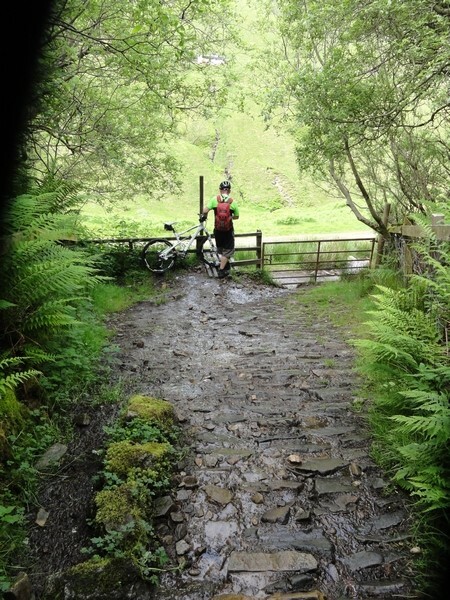 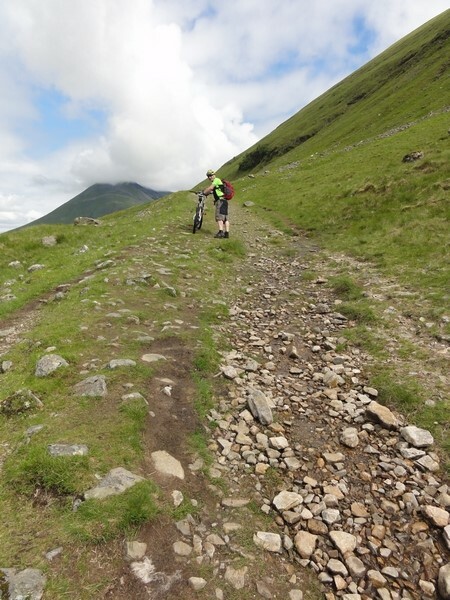 A mixture of tarmac road, landrover track and single track make this a rewarding mountain bike trek through interesting scenery. 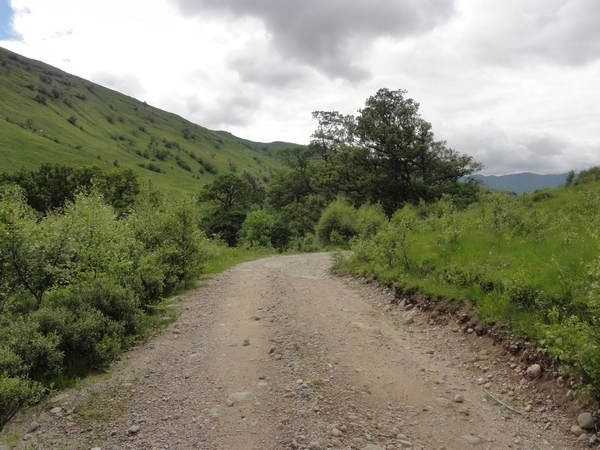 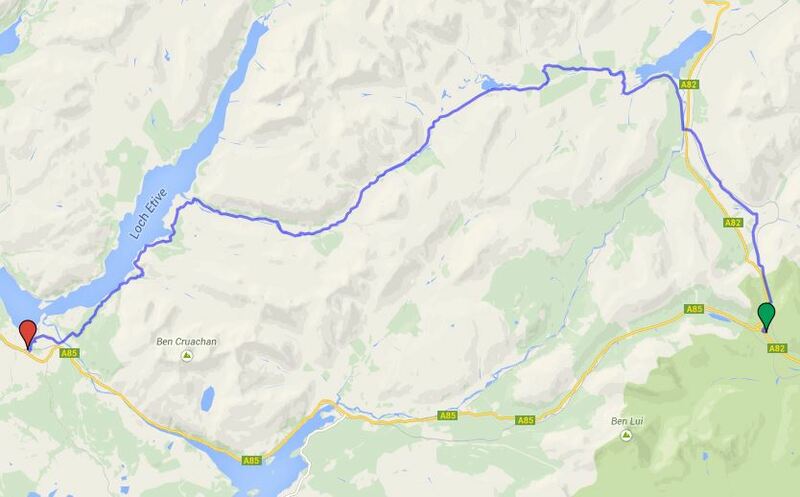 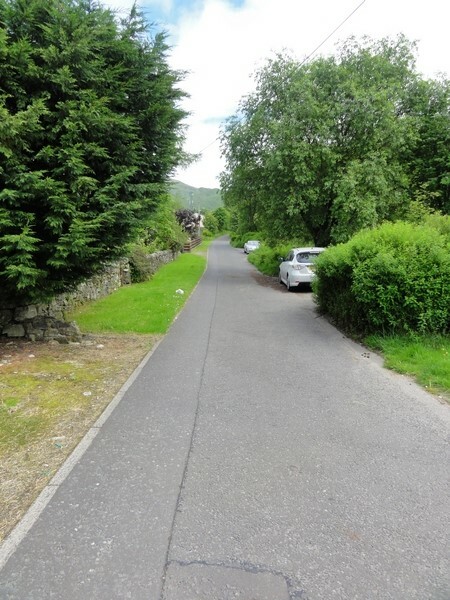 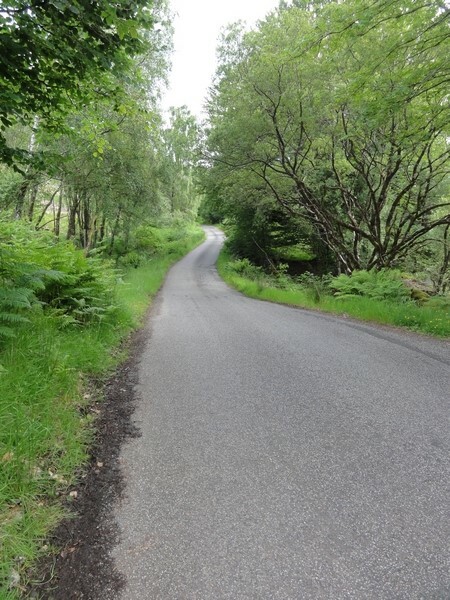 This route is best run from Tyndrum to Taynuilt, as the route is actually downhill from Tyndrum. 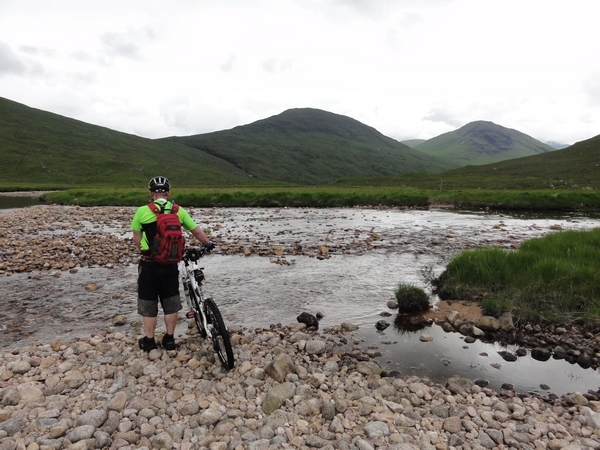 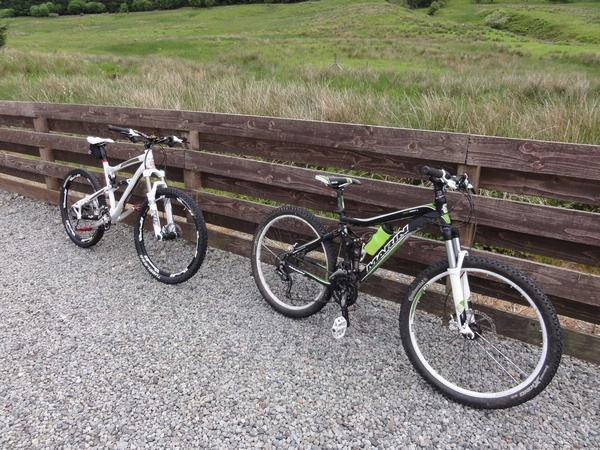 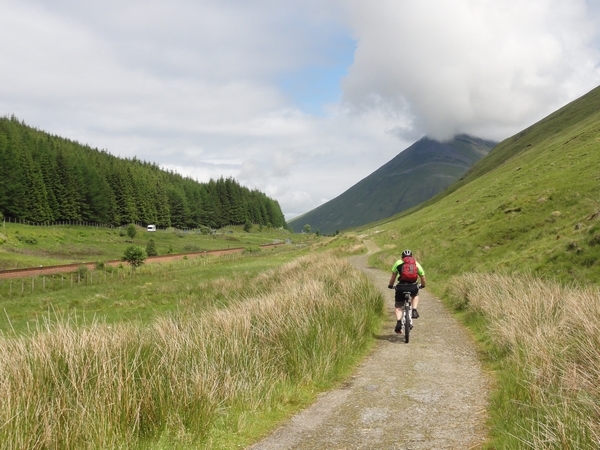 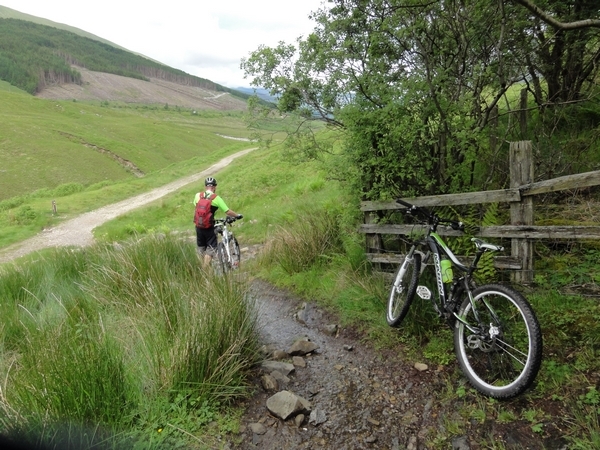 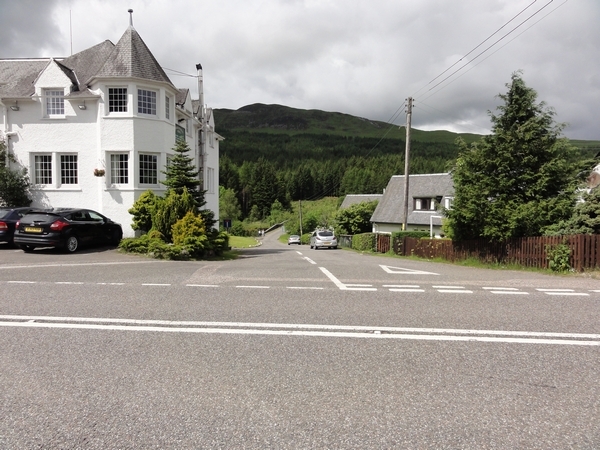 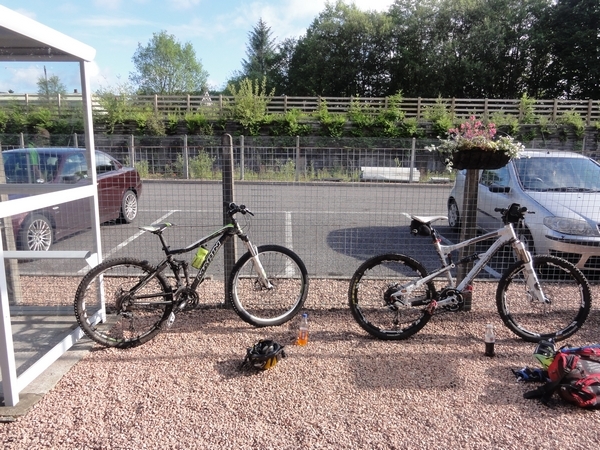 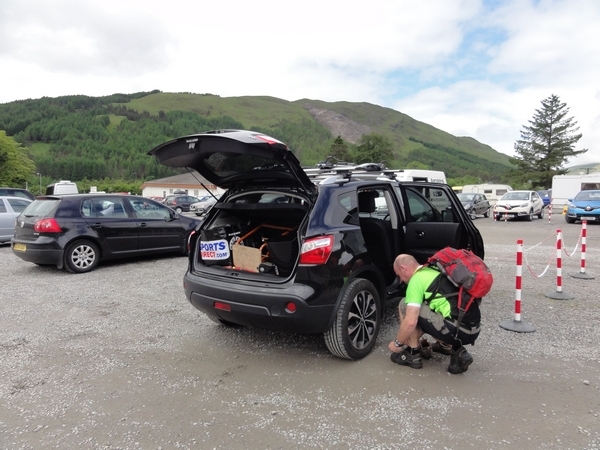 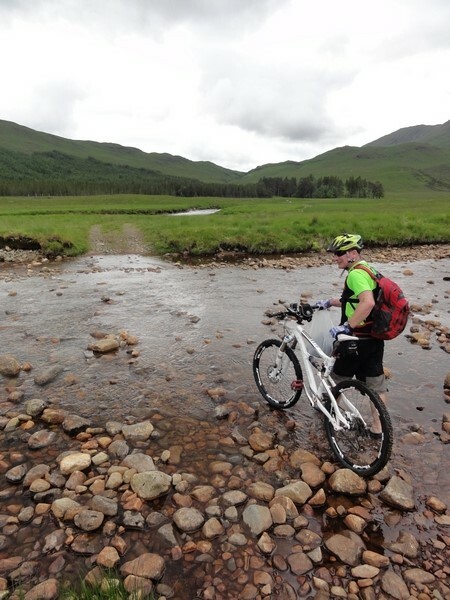 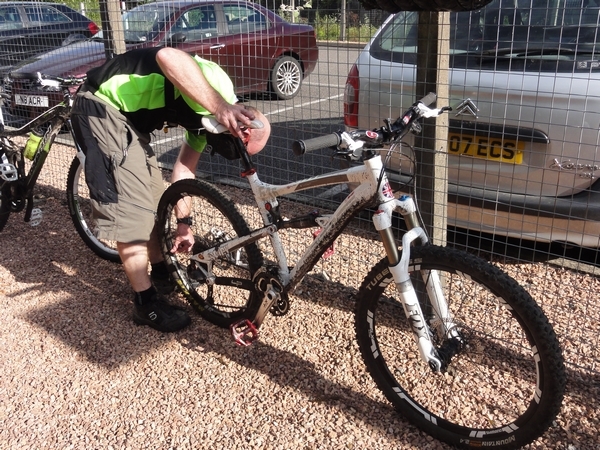 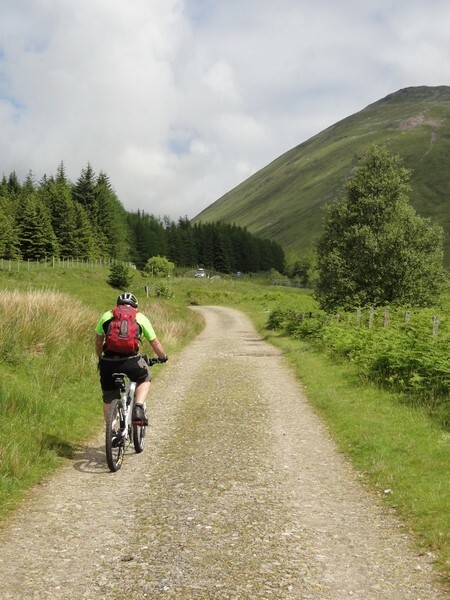 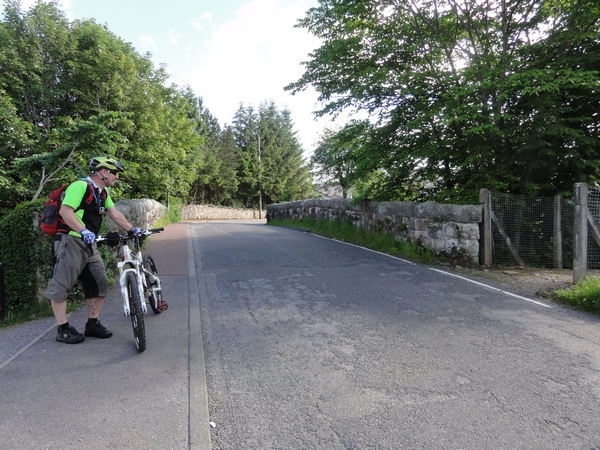 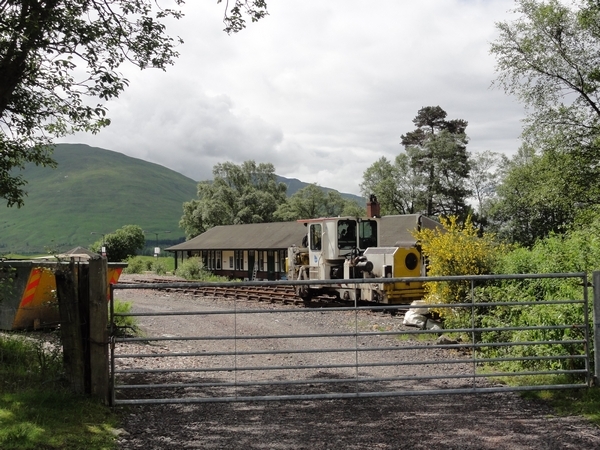 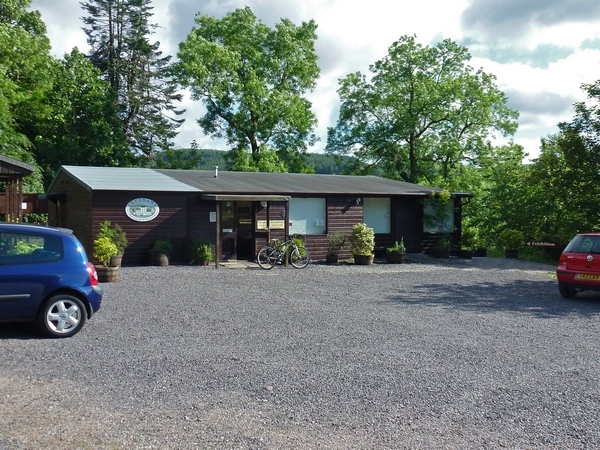 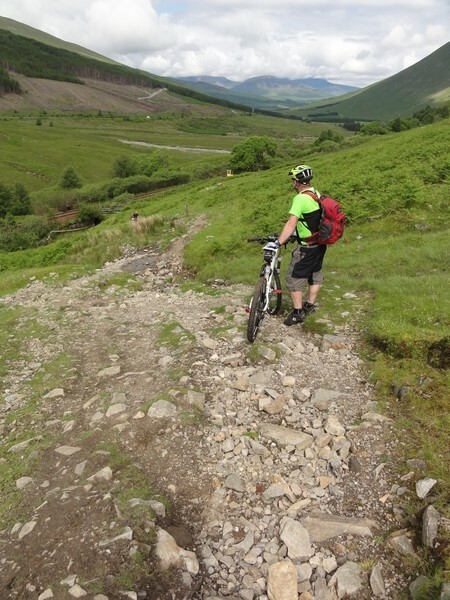 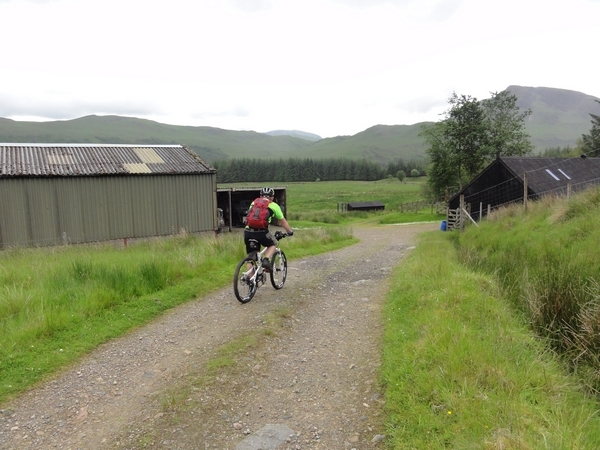 To make logistics easier, leave the car at Tyndrum and take the bikes by train from Taynuilt back to Tyndrum. 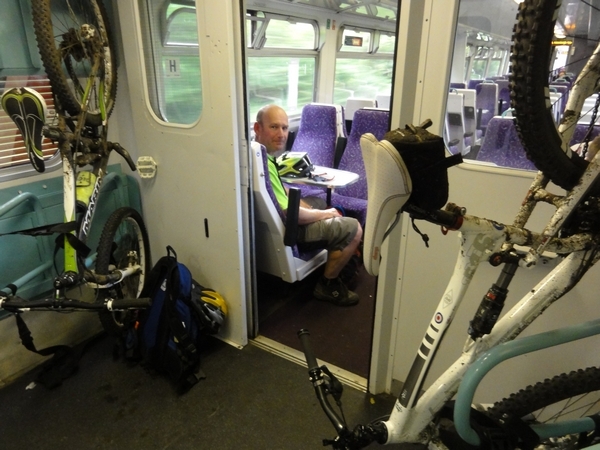 This requires you to book bike space on the train in advance with Scot-Rail. 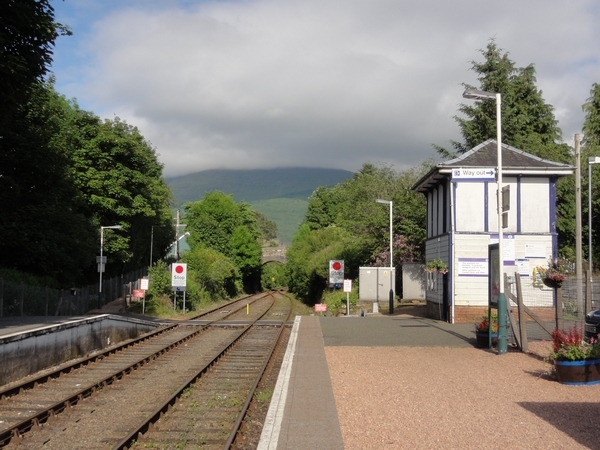 The only draw back about getting the train at the end of the trip, is you have to make sure you have enough time to complete it in time to catch the train. 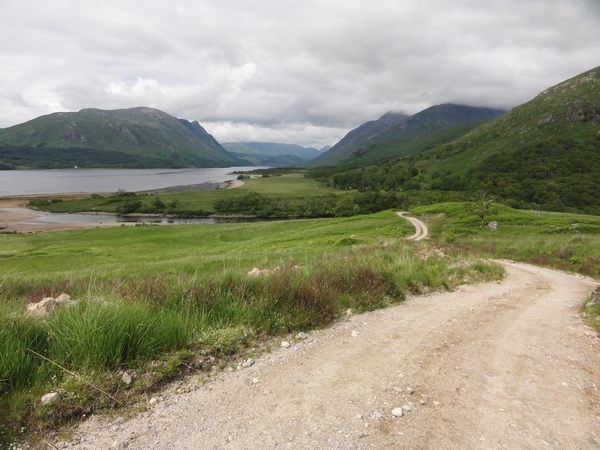 The route takes longer than the distance suggests, especially along the shores of Loch Etive, so add at least an extra hour onto your calculated journey time. 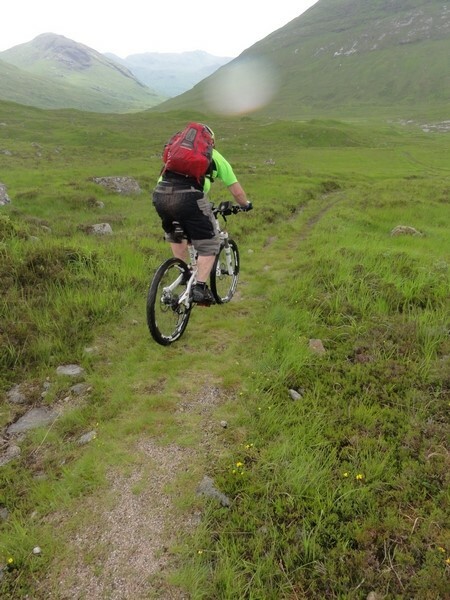 High levels of fitness are required only due to the distance involved. 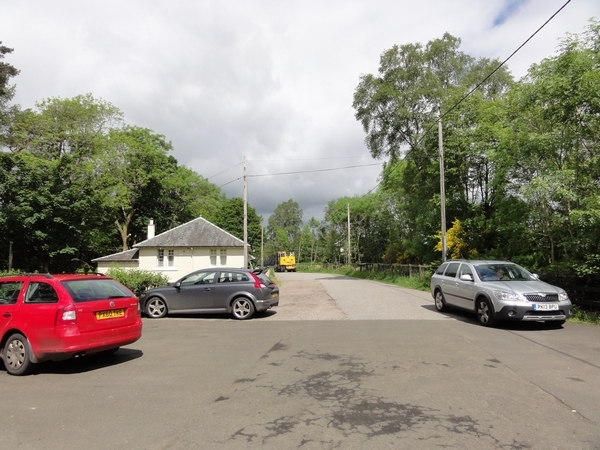 Starting at the car park at the Green Welly, turn right as you leave the car park and cross the bridge. 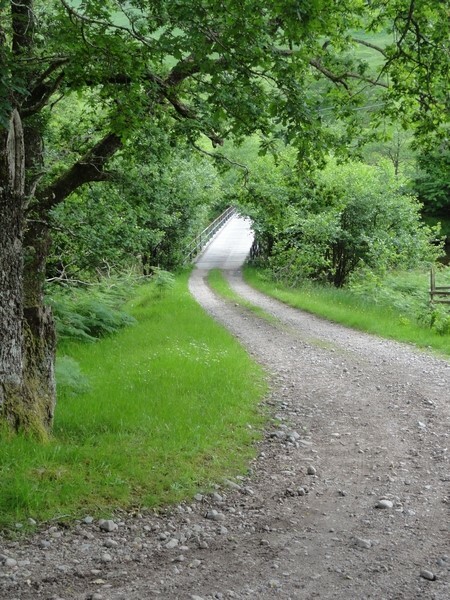 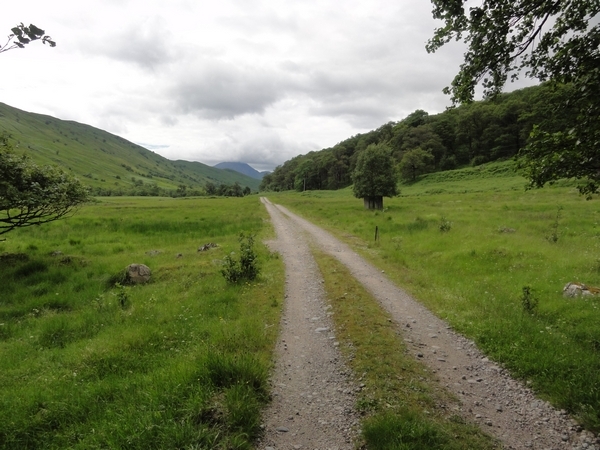 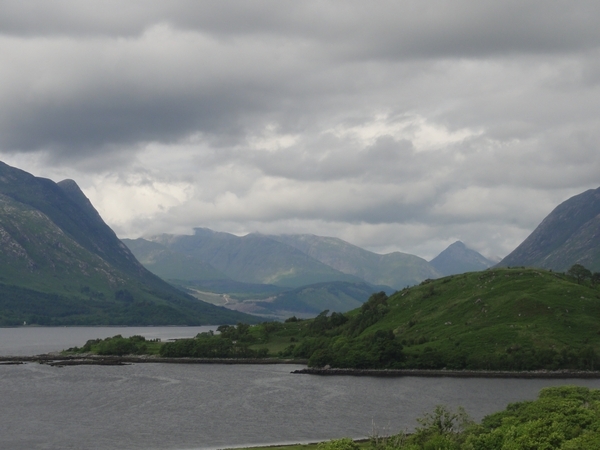 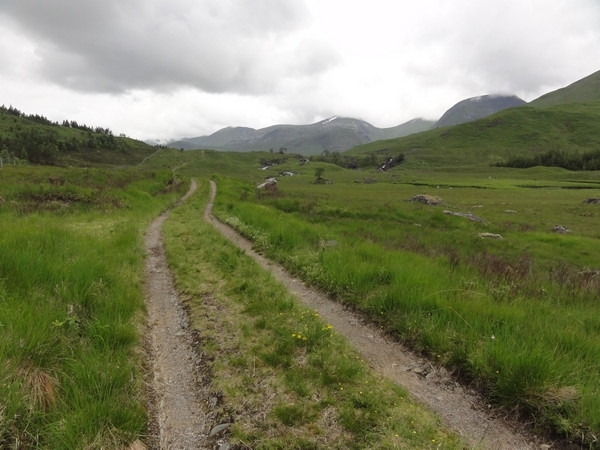 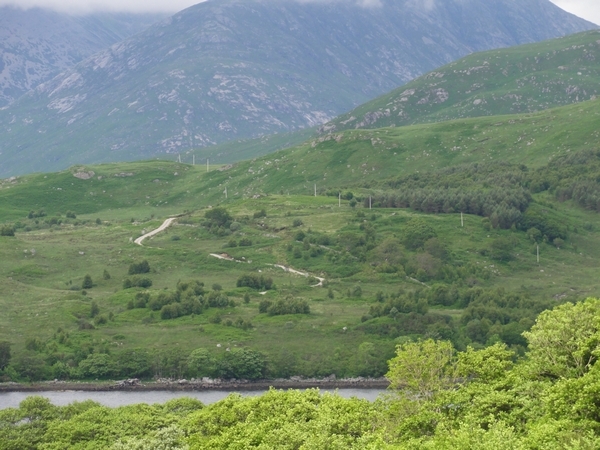 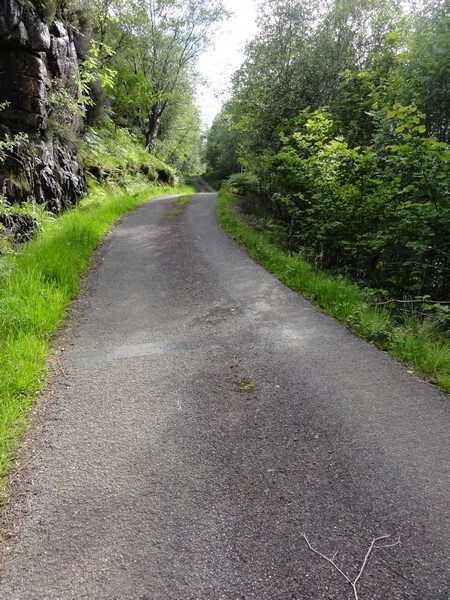 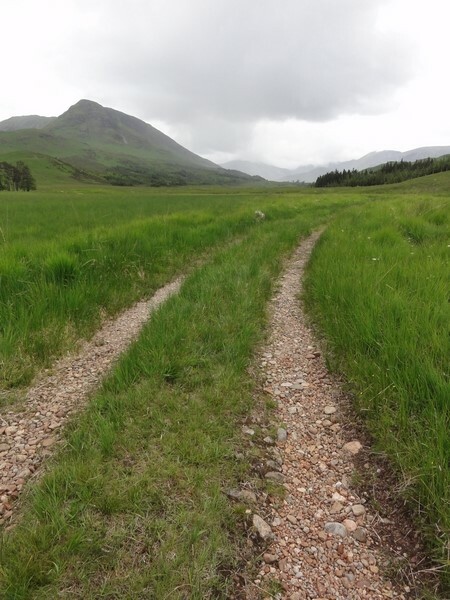 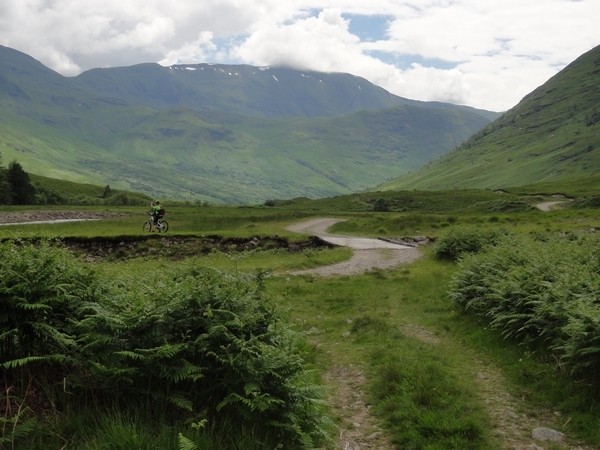 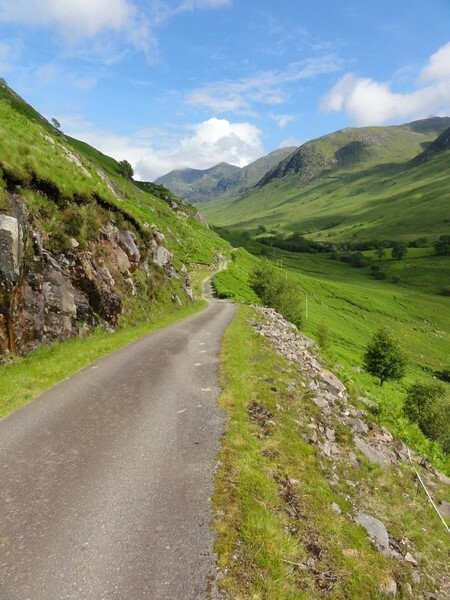 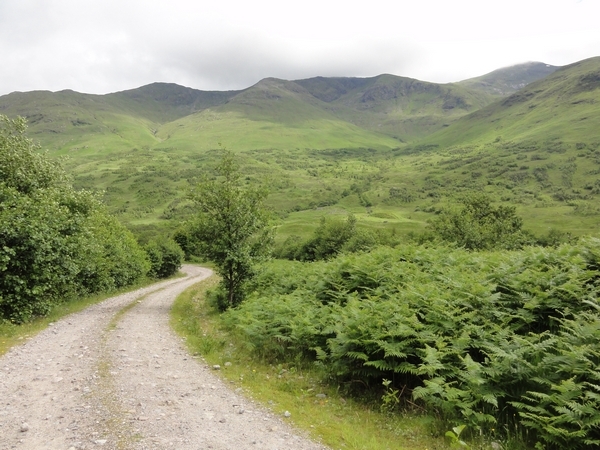 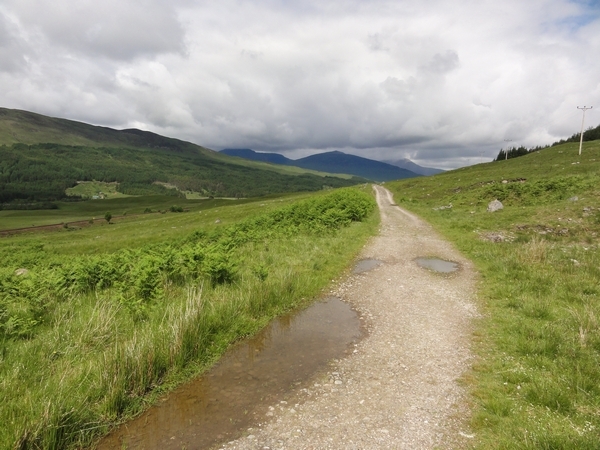 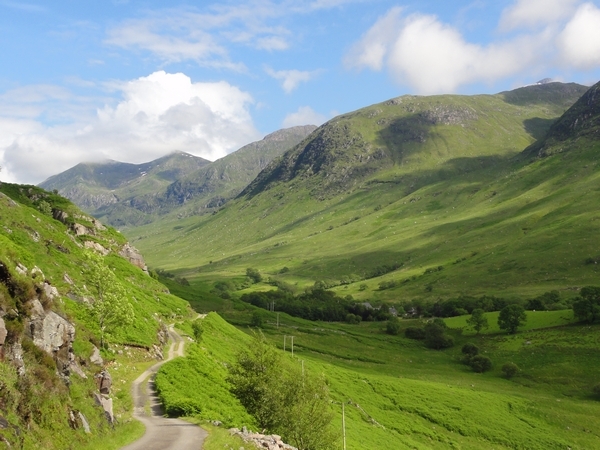 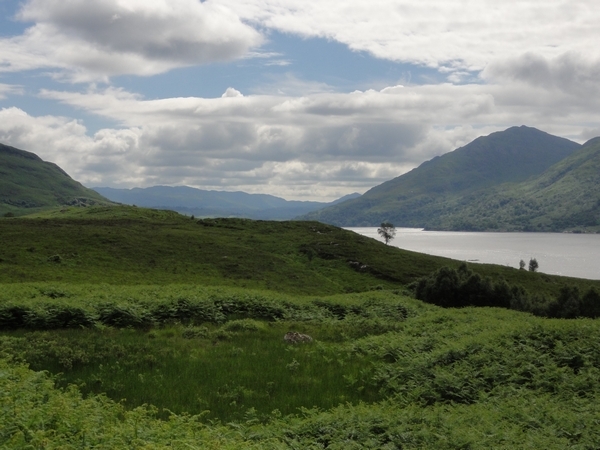 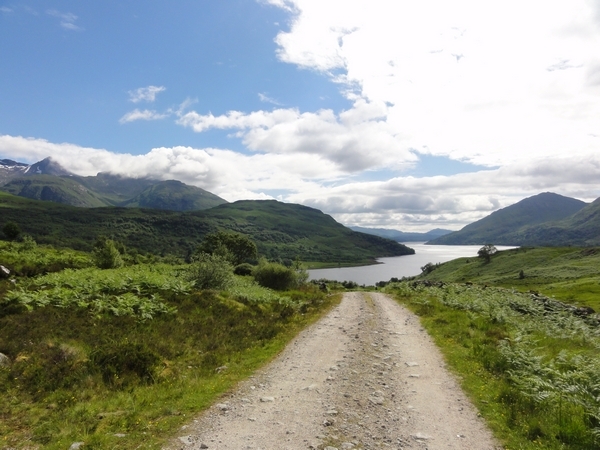 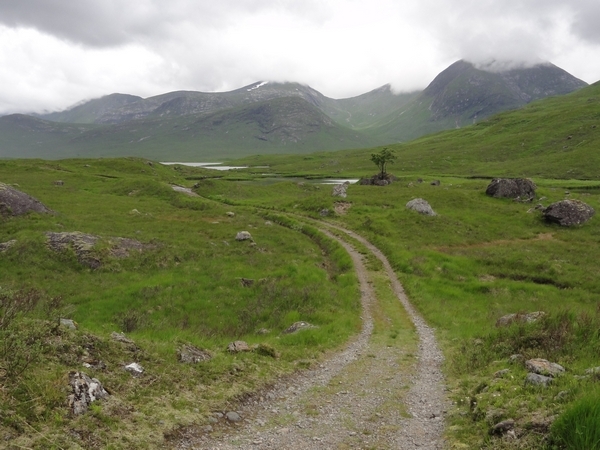 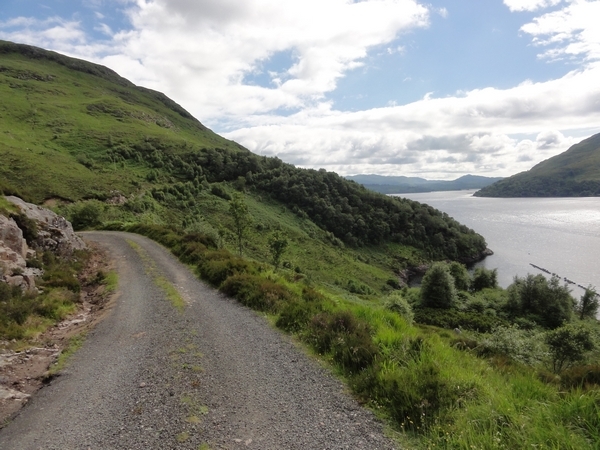 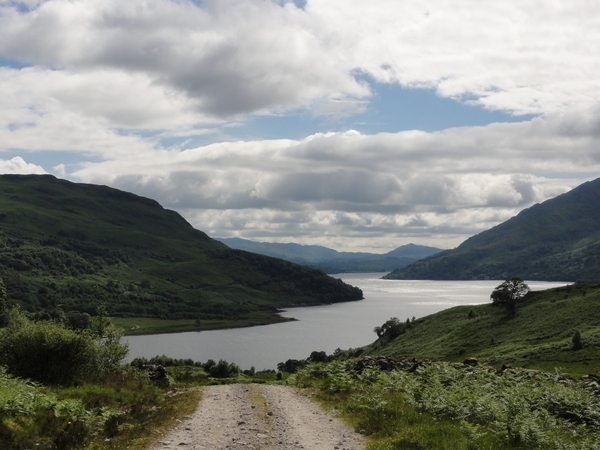 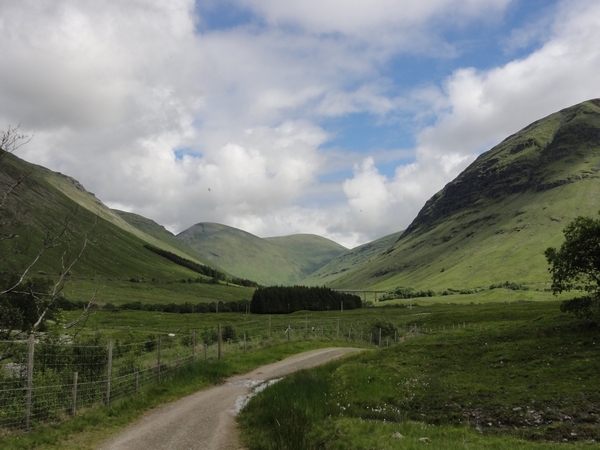 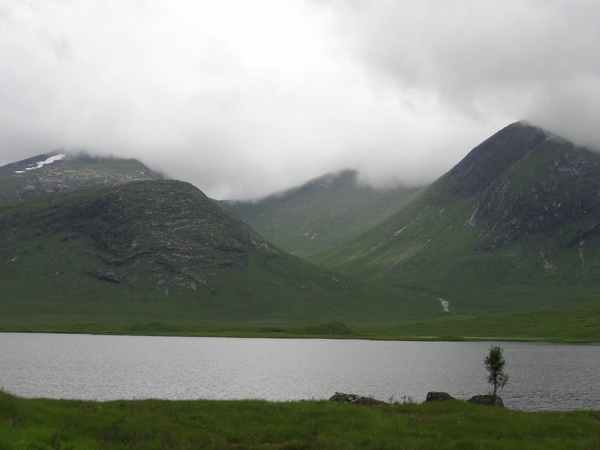 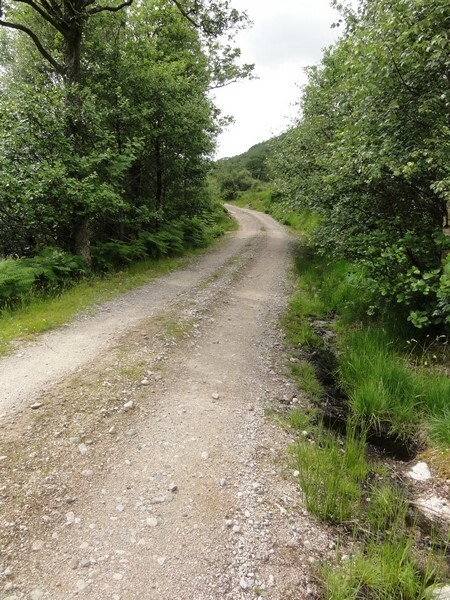 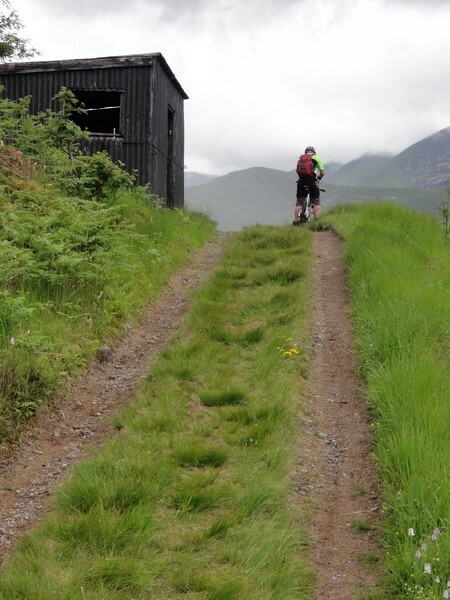 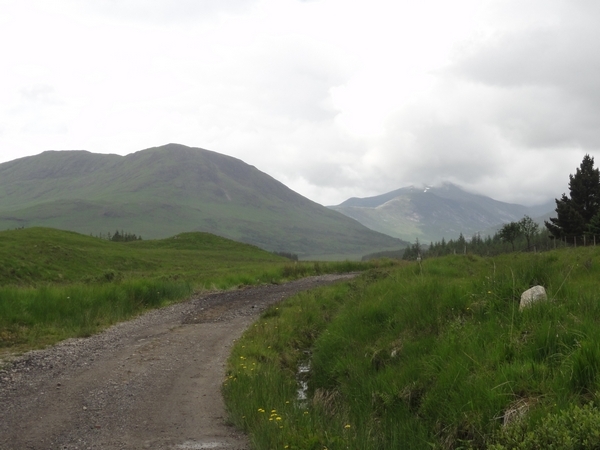 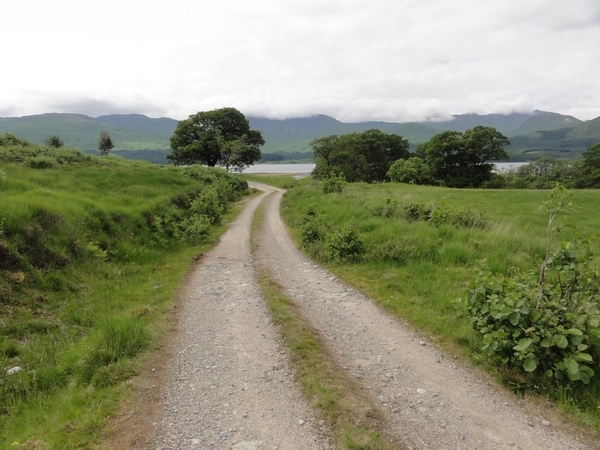 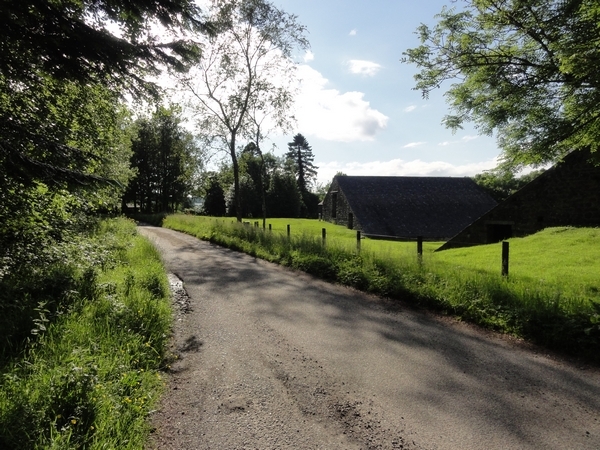 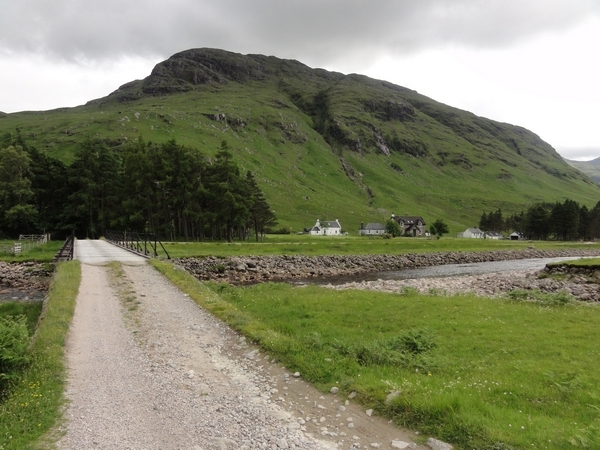 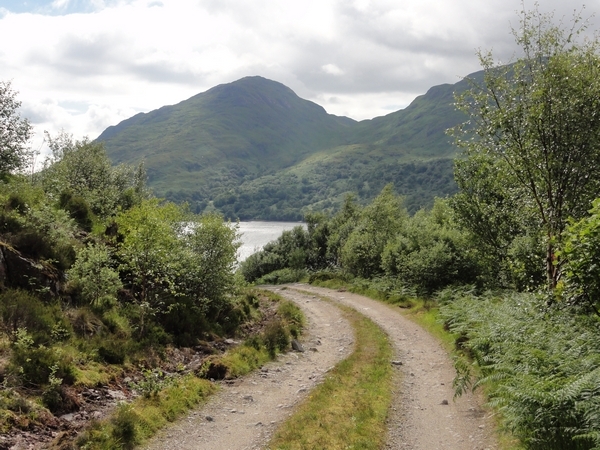 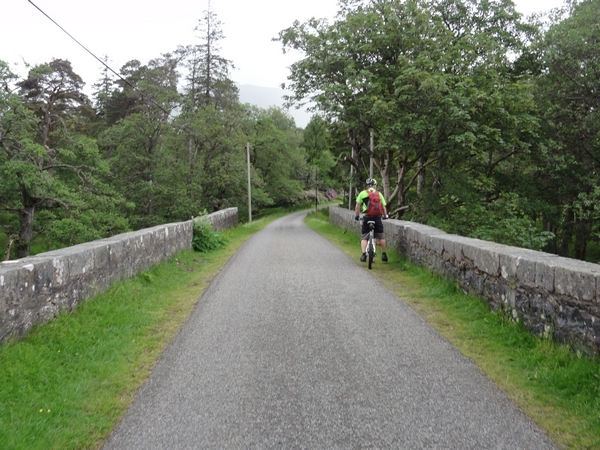 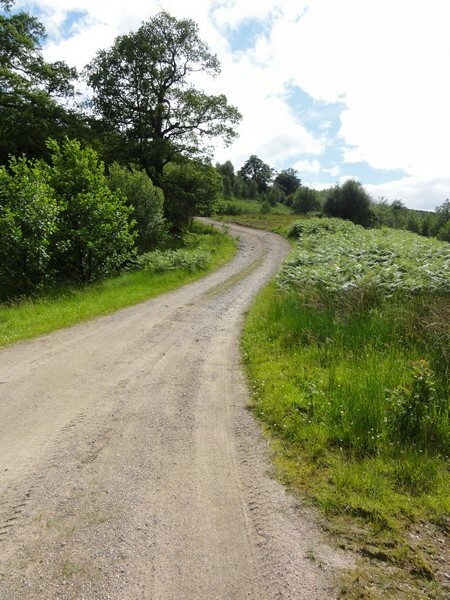 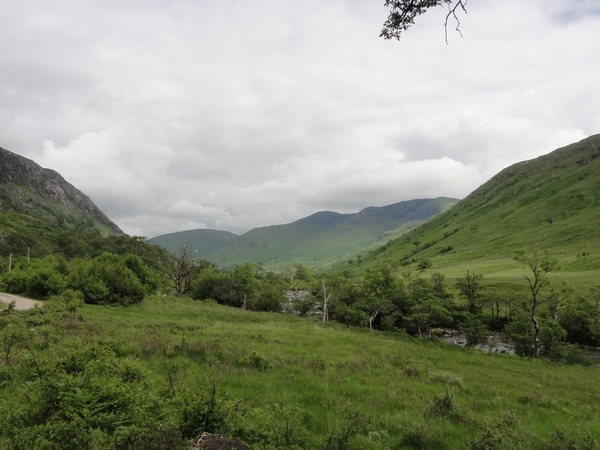 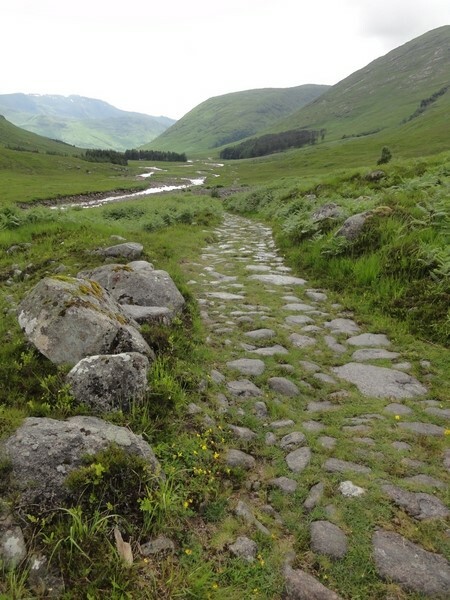 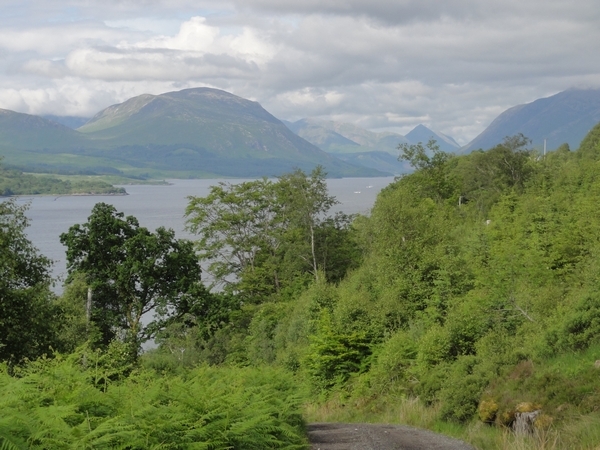 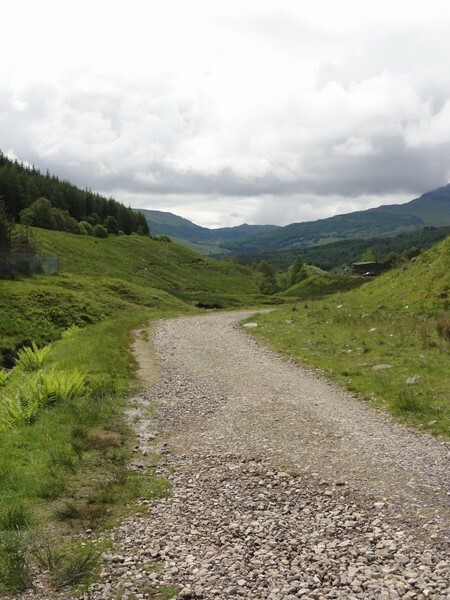 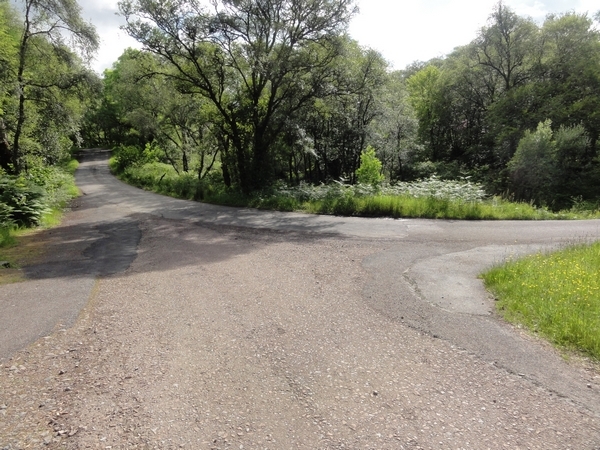 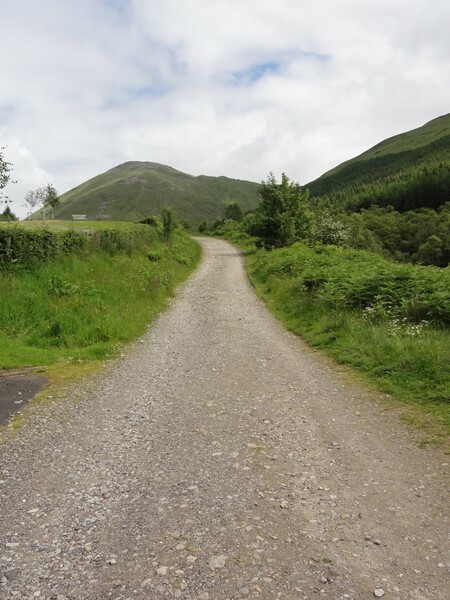 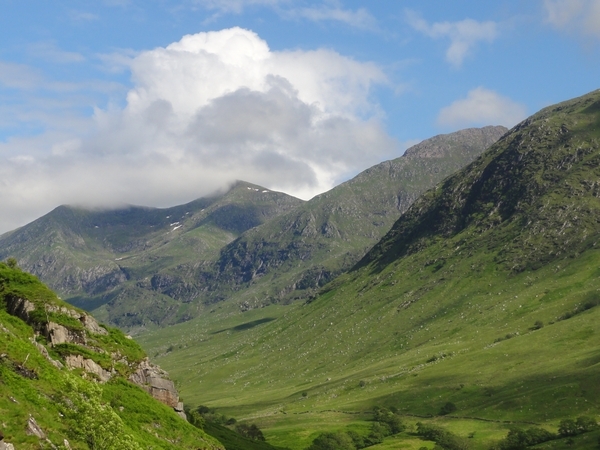 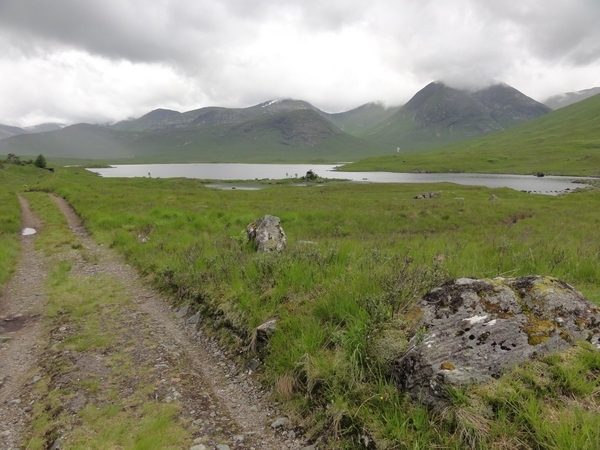 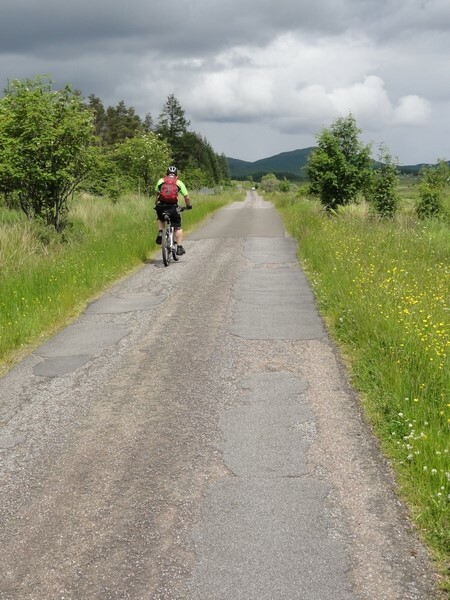 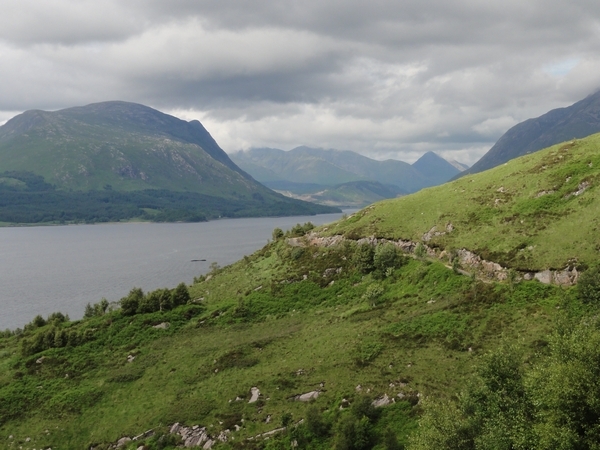 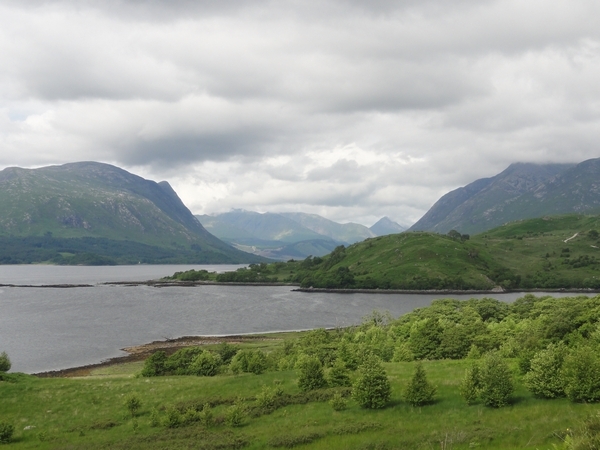 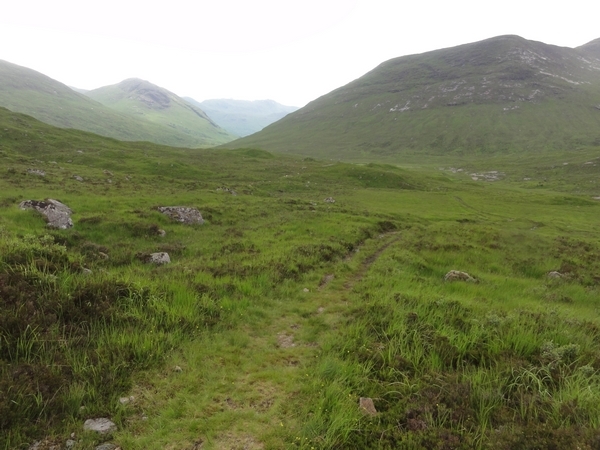 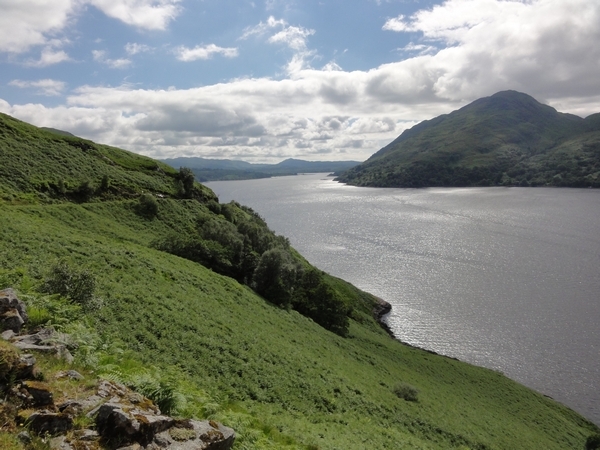 Take the first road on the right and join the West Highland Way. 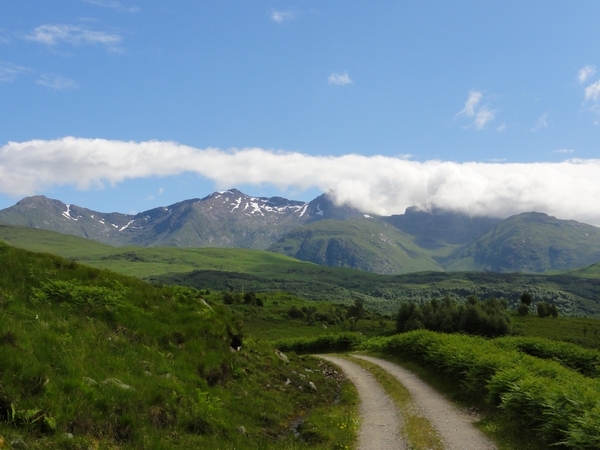 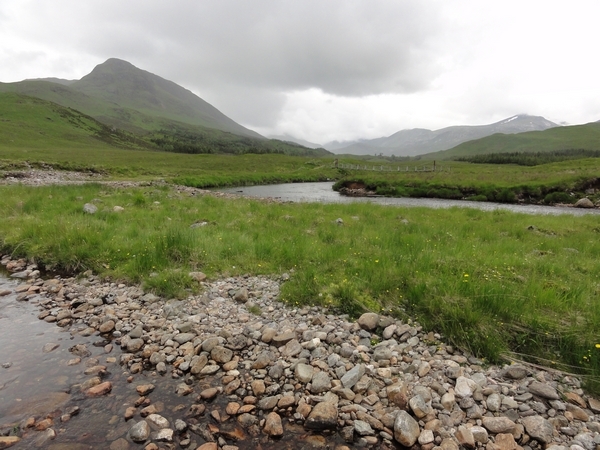 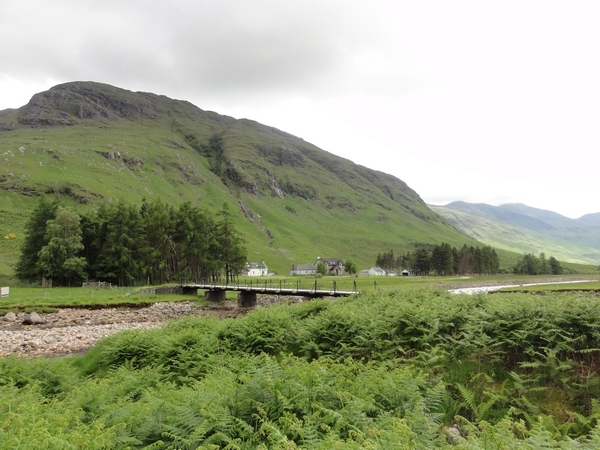 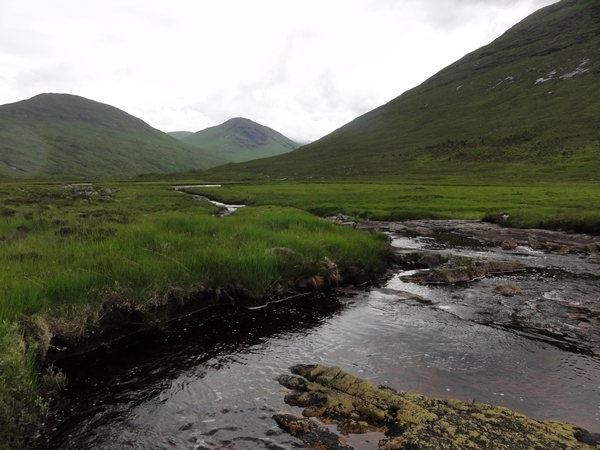 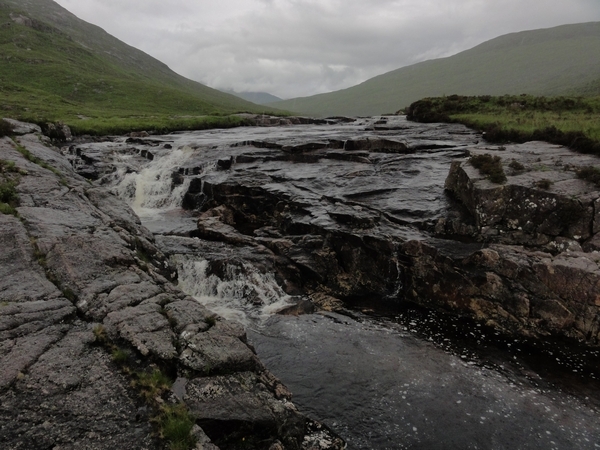 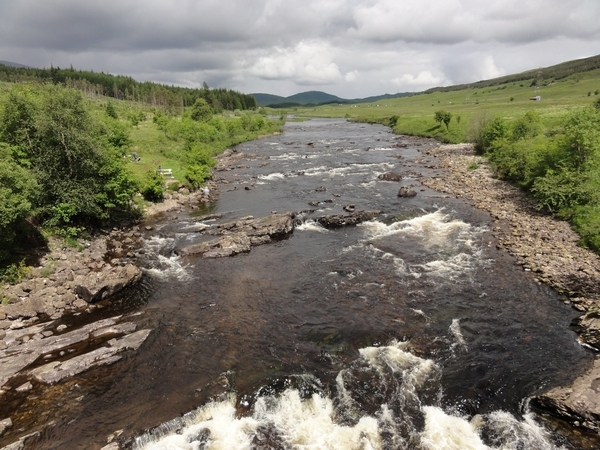 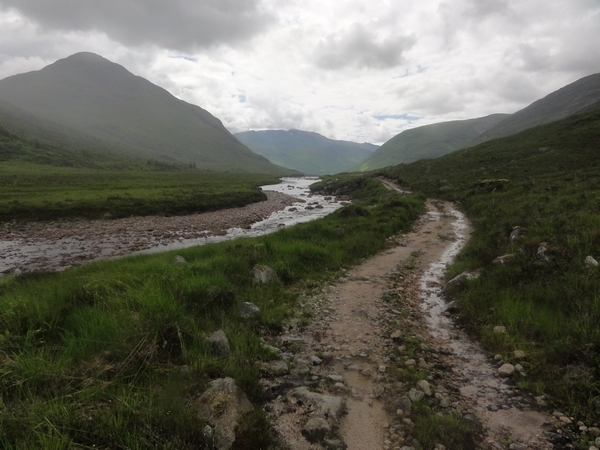 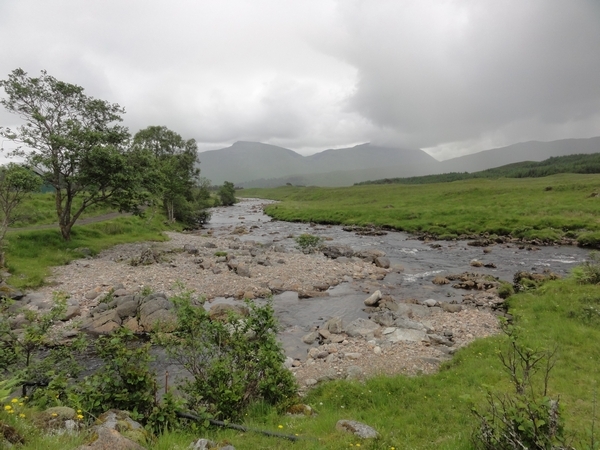 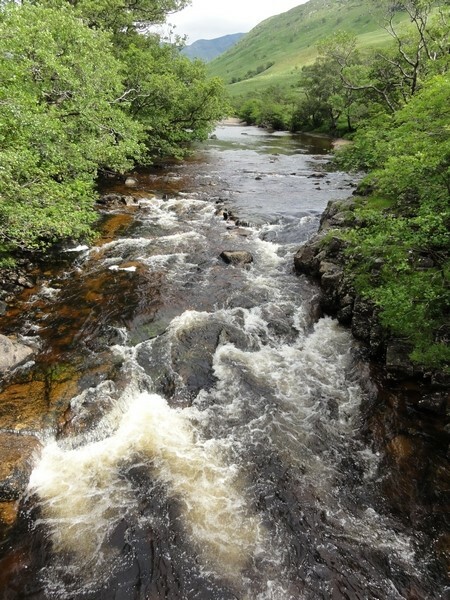 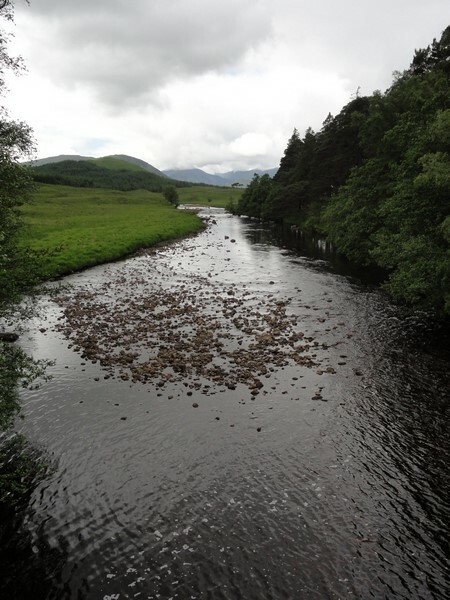 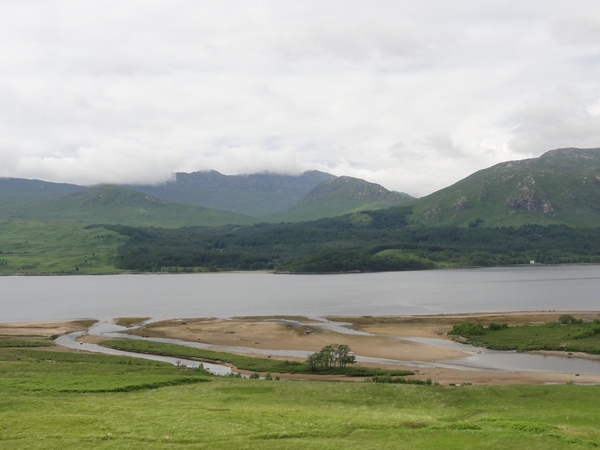 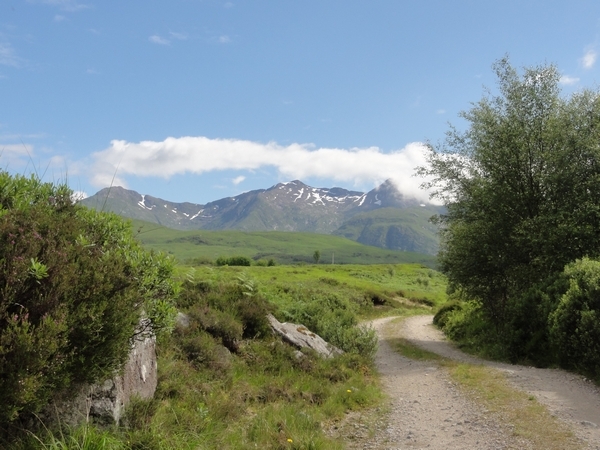 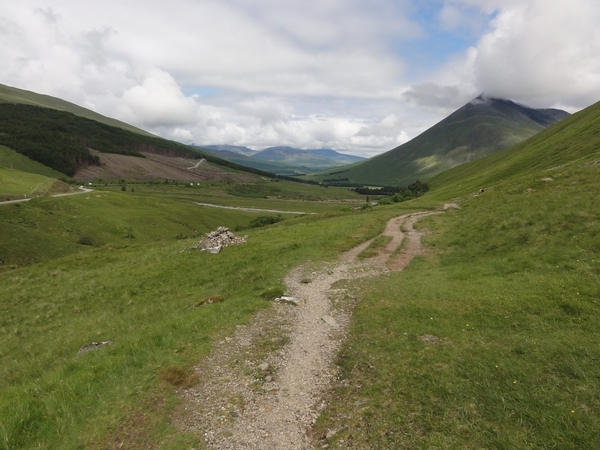 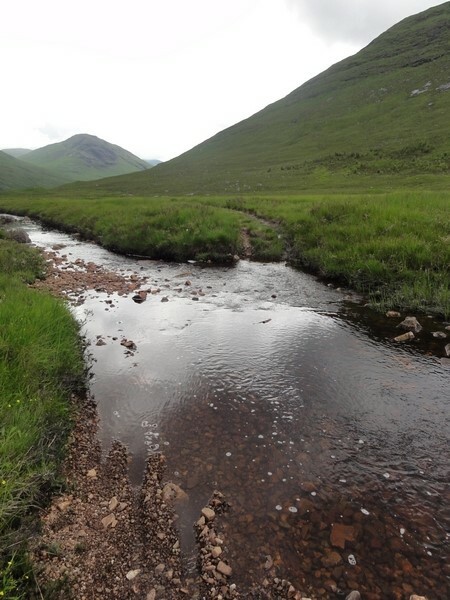 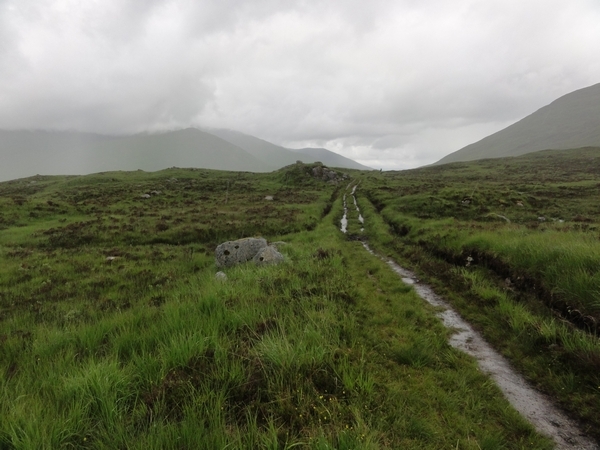 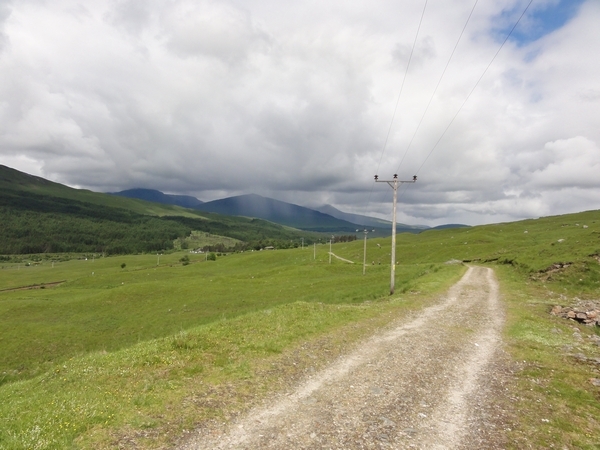 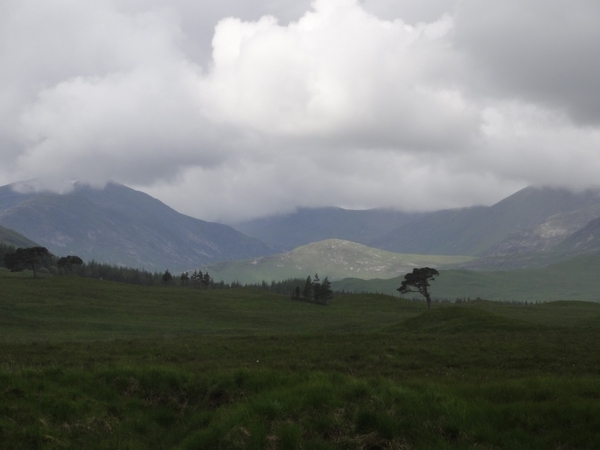 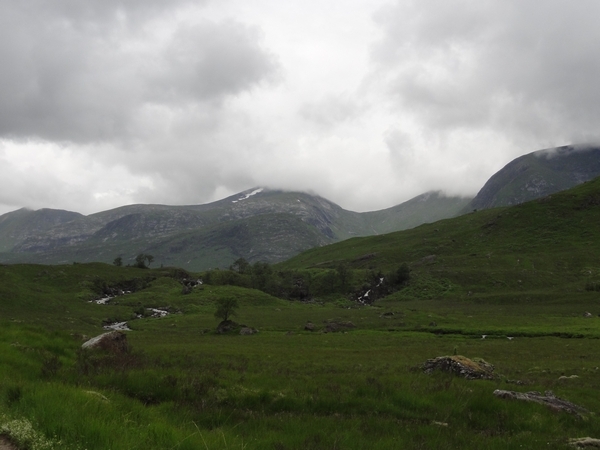 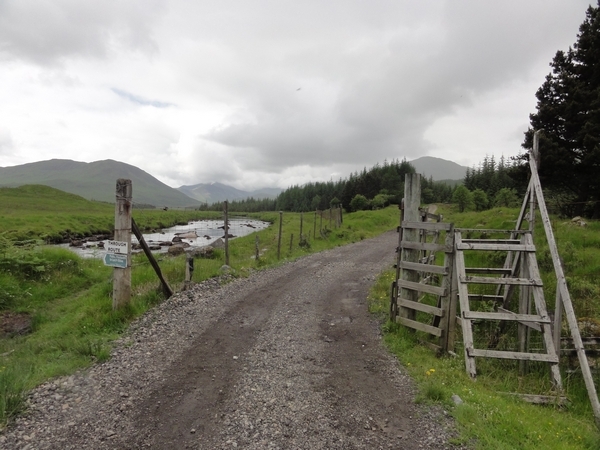 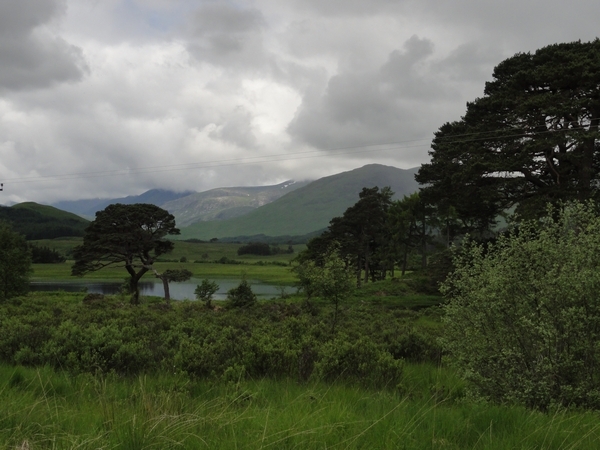 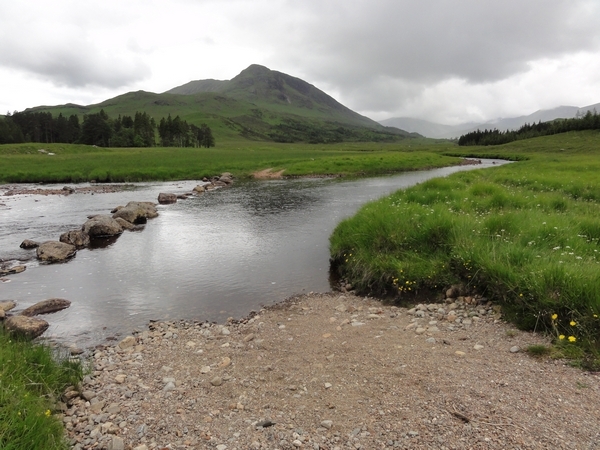 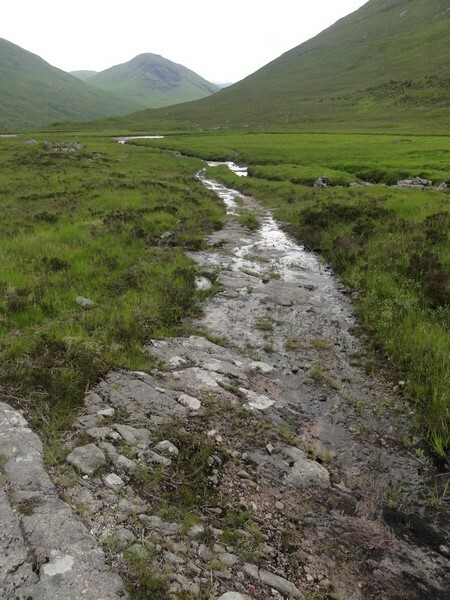 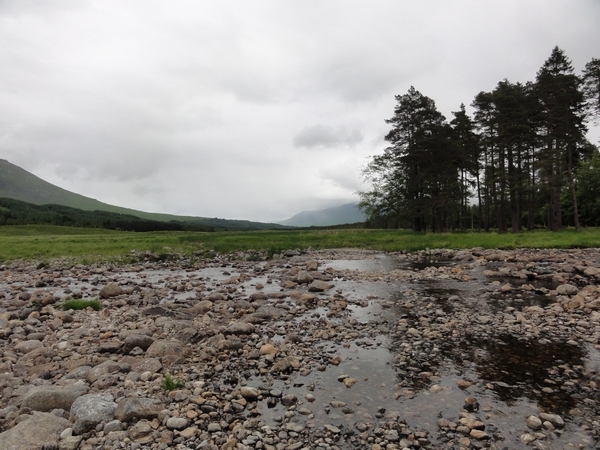 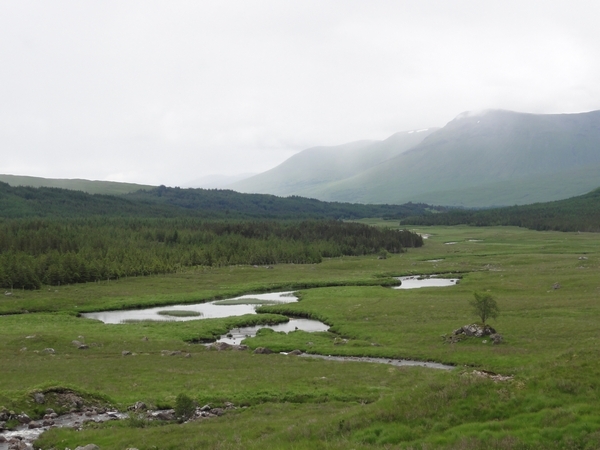 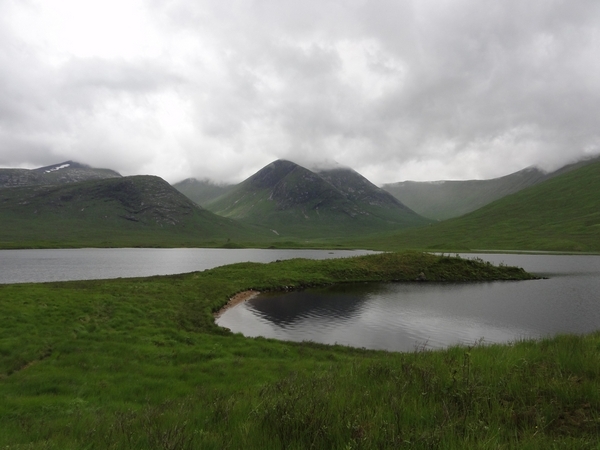 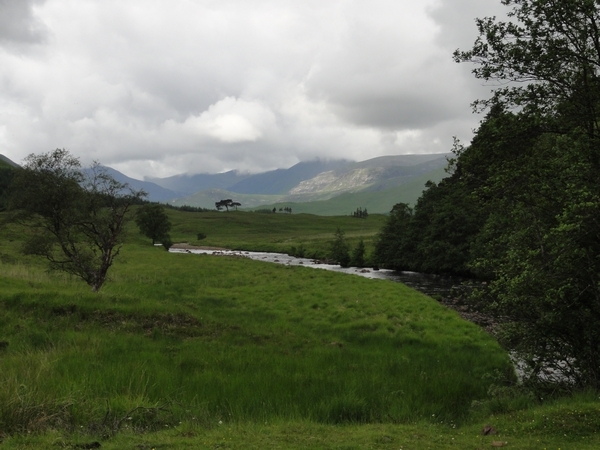 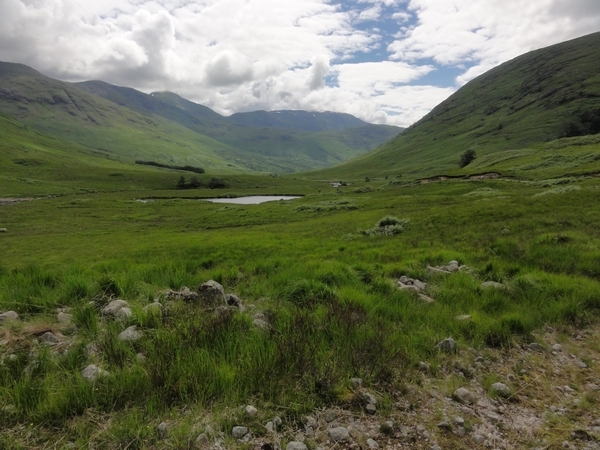 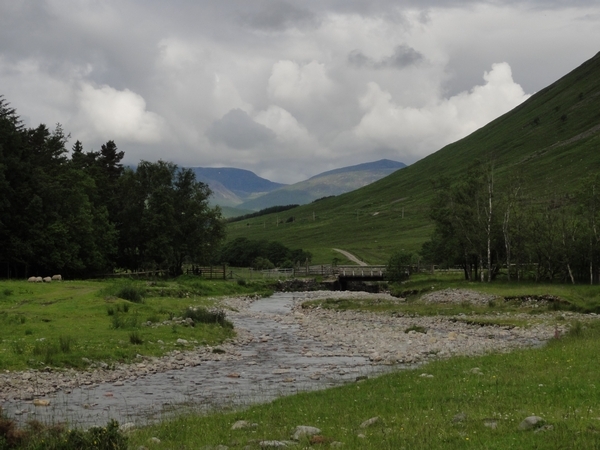 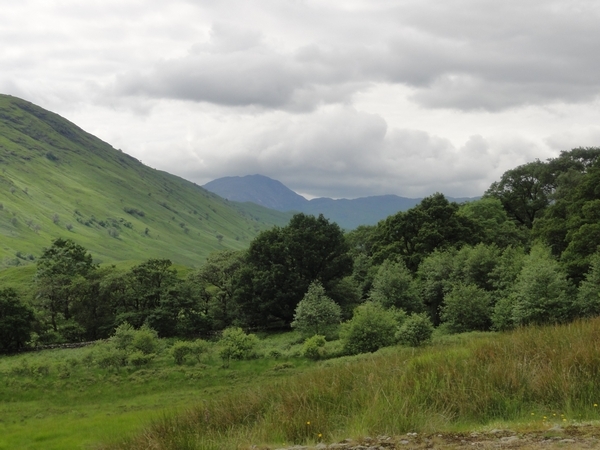 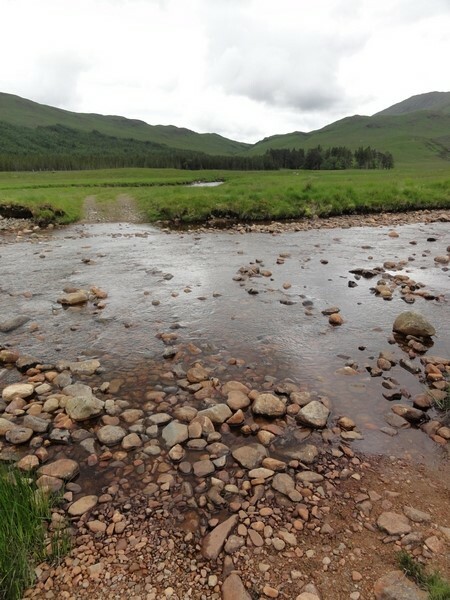 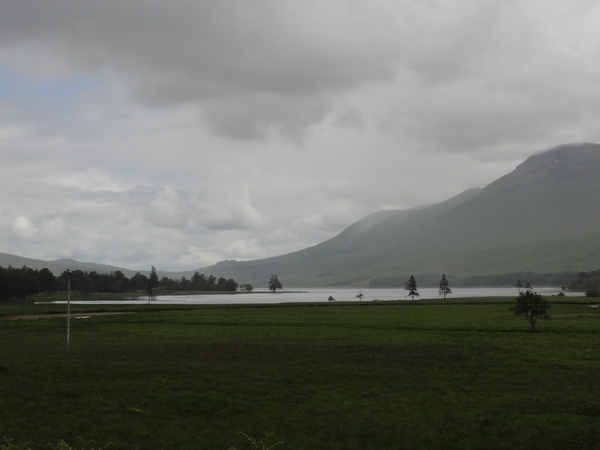 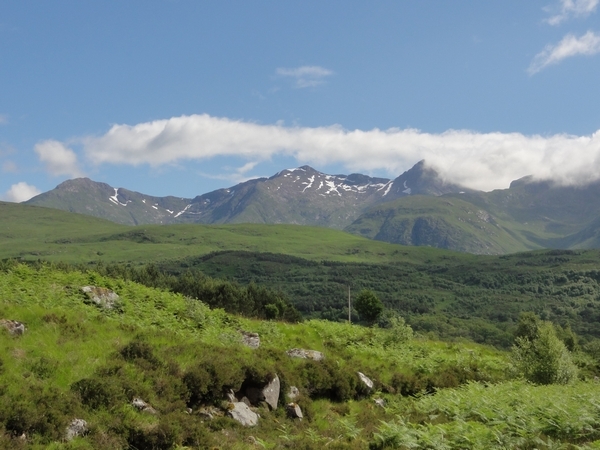 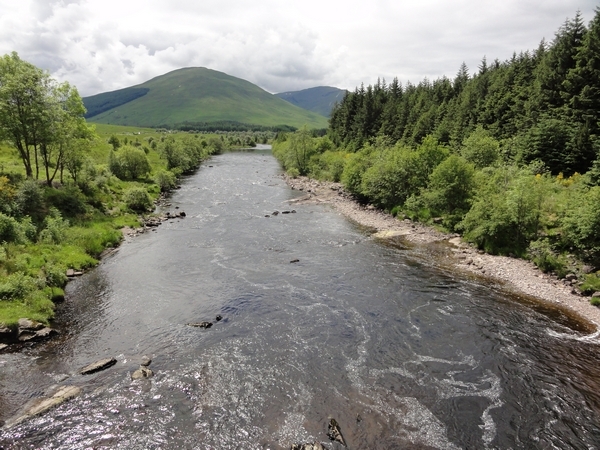 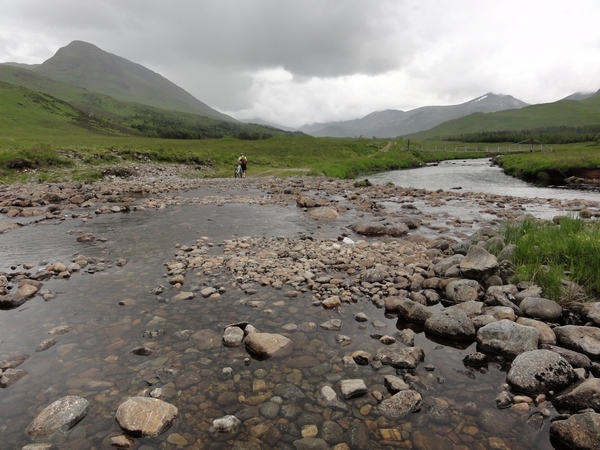 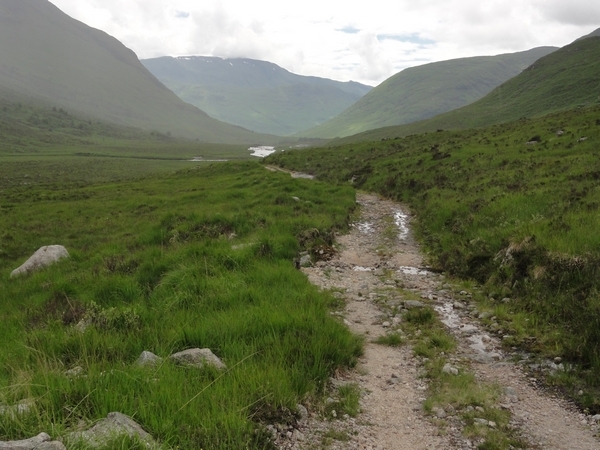 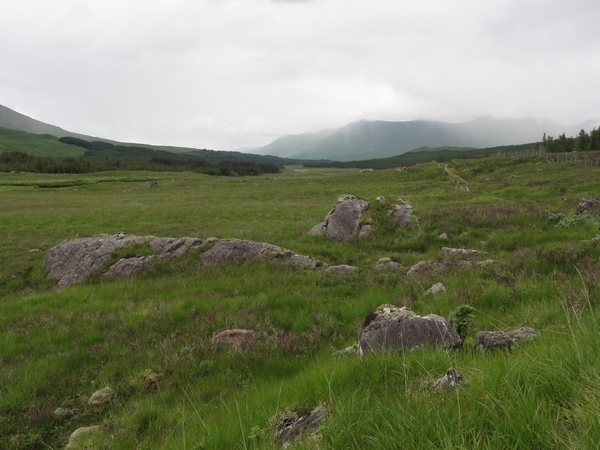 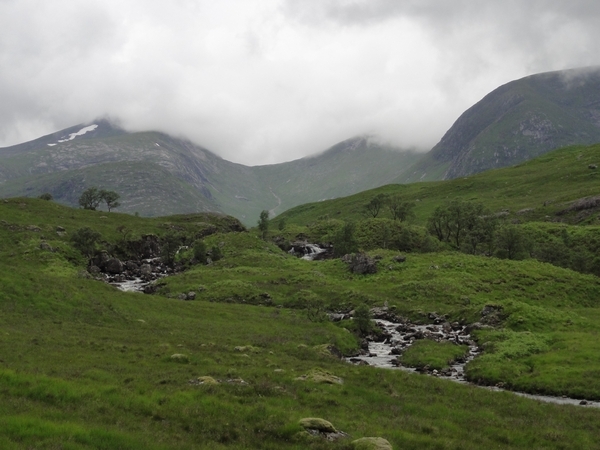 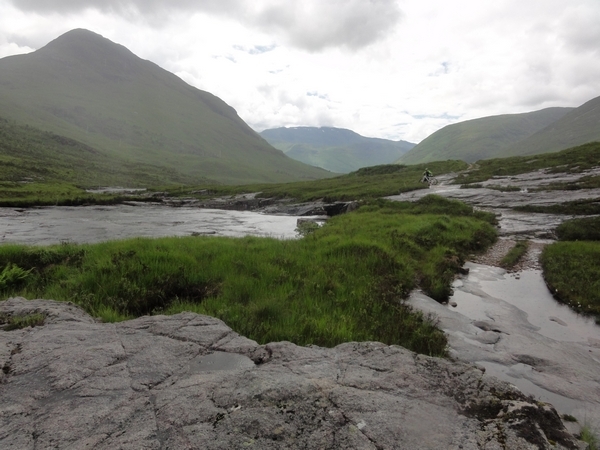 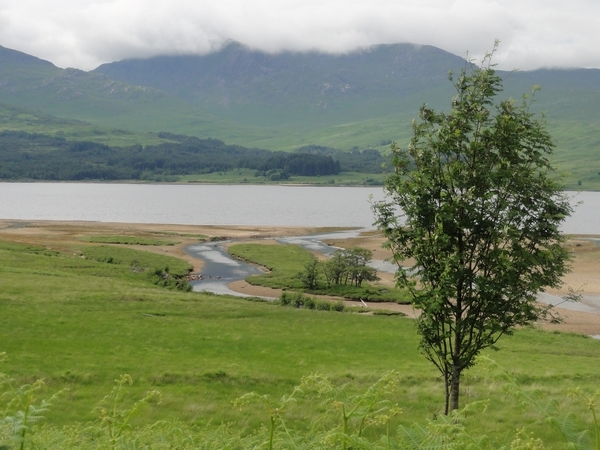 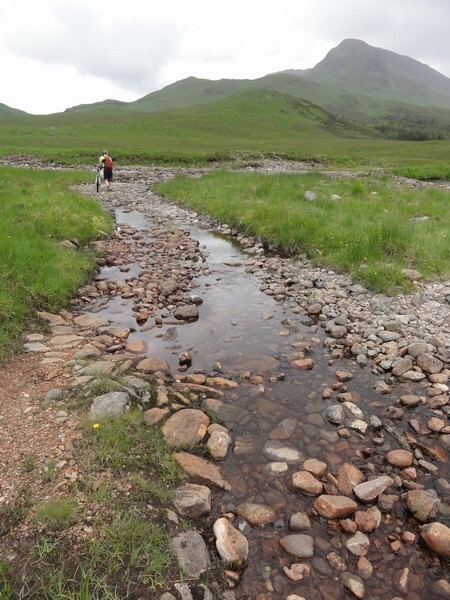 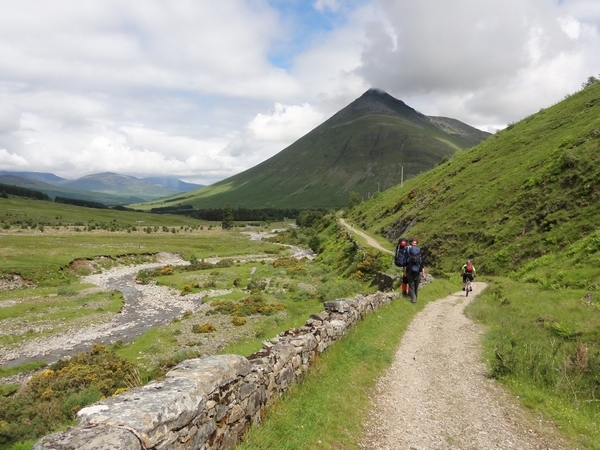 Follow the West Highland way to Bridge of Orchy. 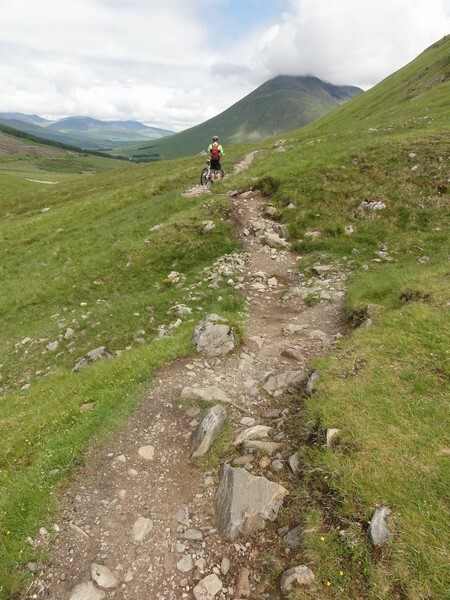 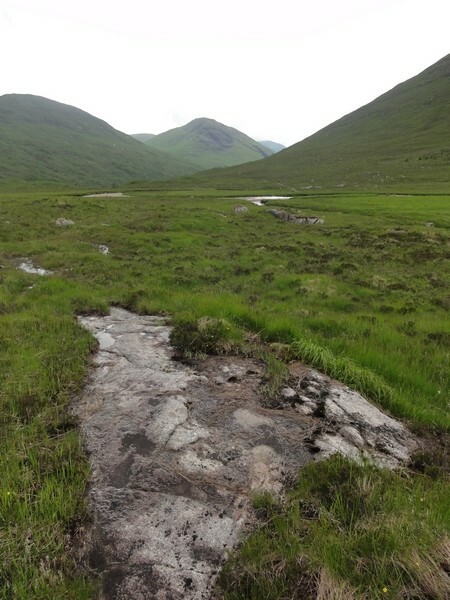 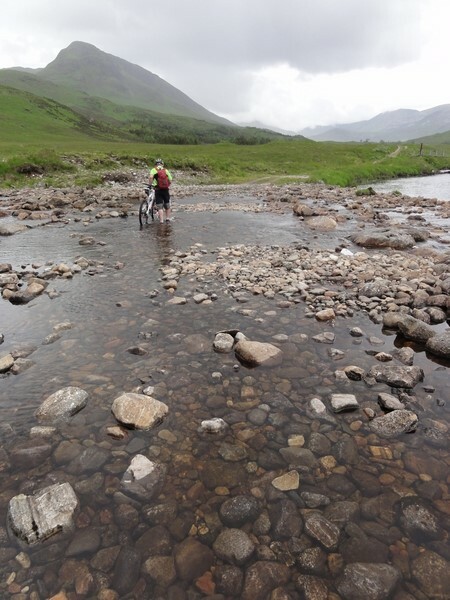 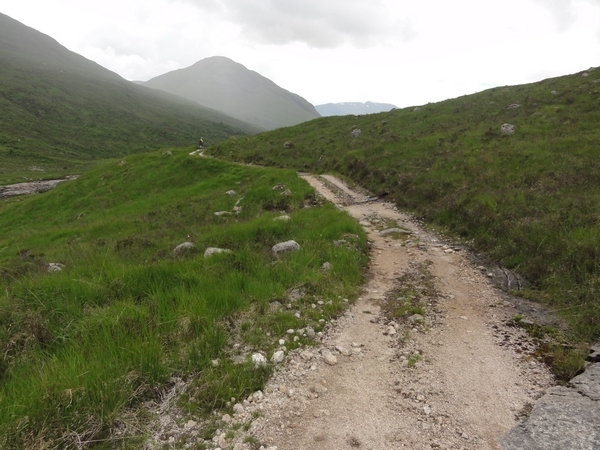 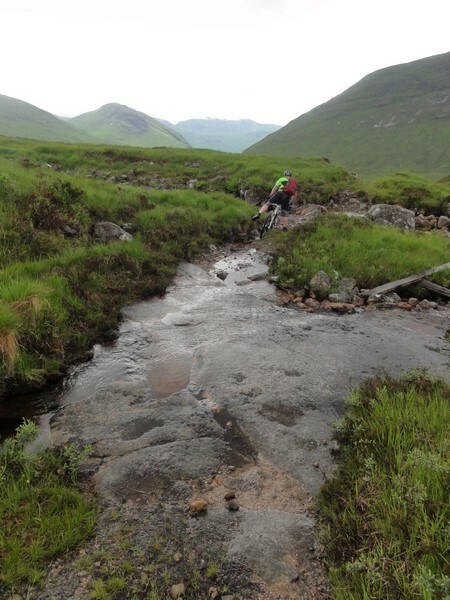 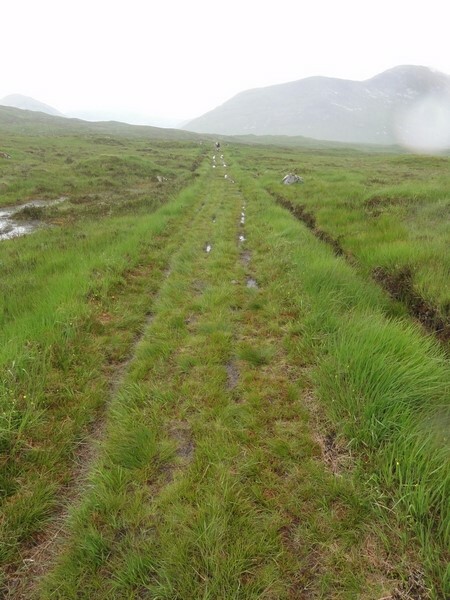 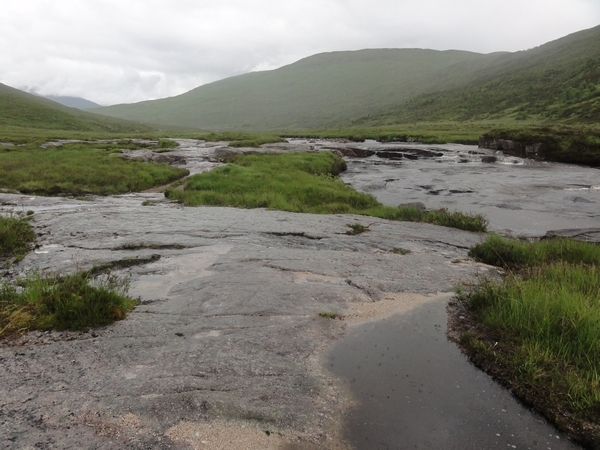 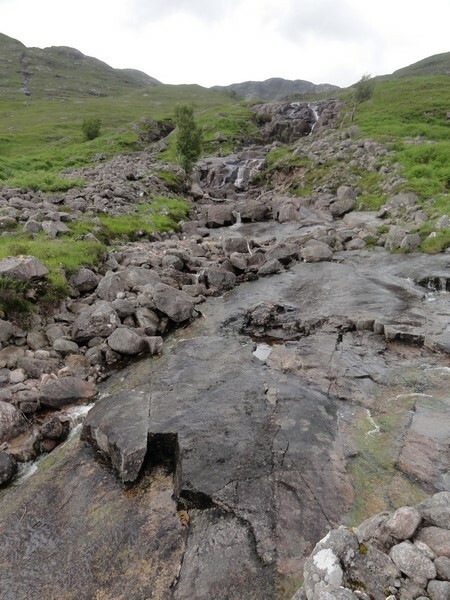 The track is rough in places and requires a little bike and hike, but progress is good and Bridge of Orchy can be reached in an hour. 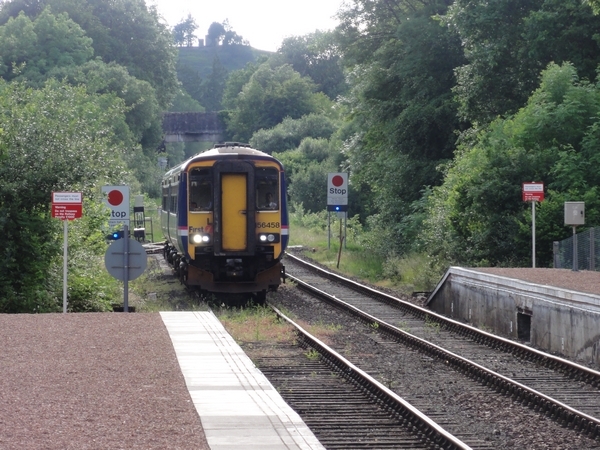 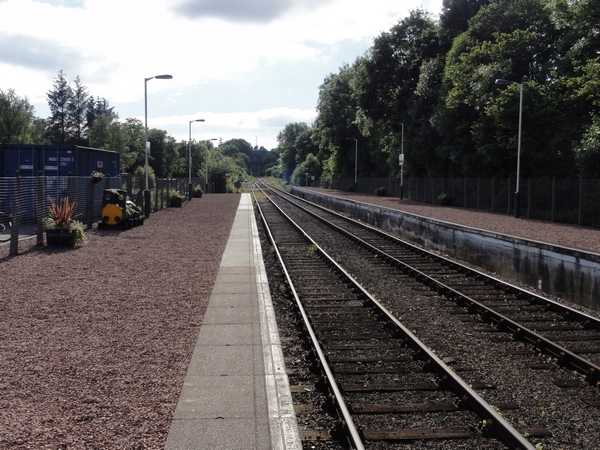 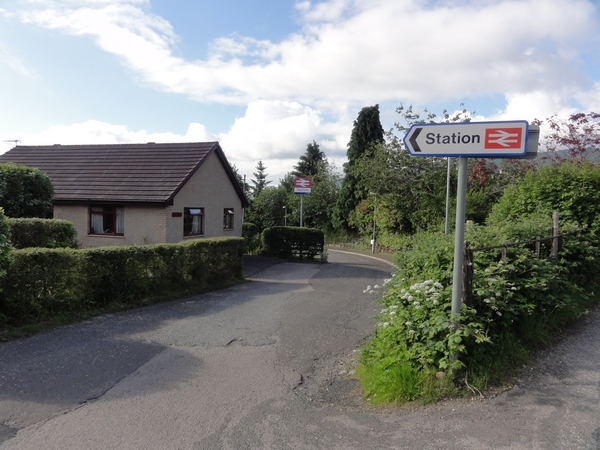 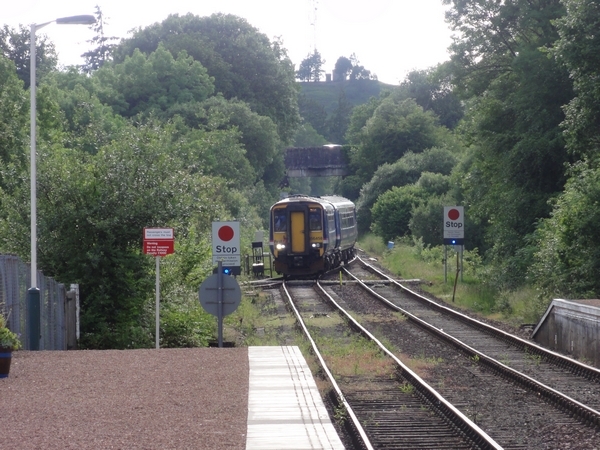 At the railway station, head down Station Brae towards the A82. 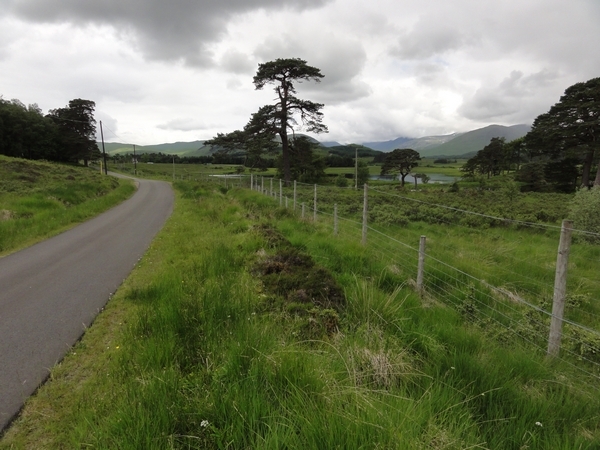 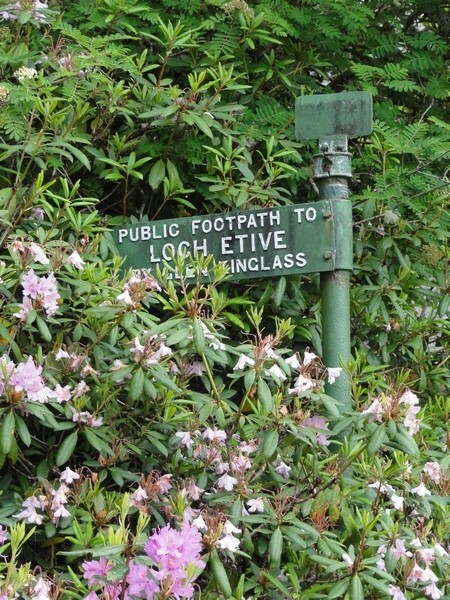 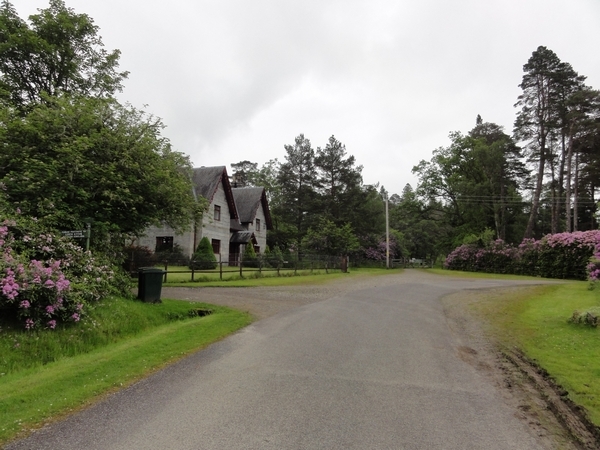 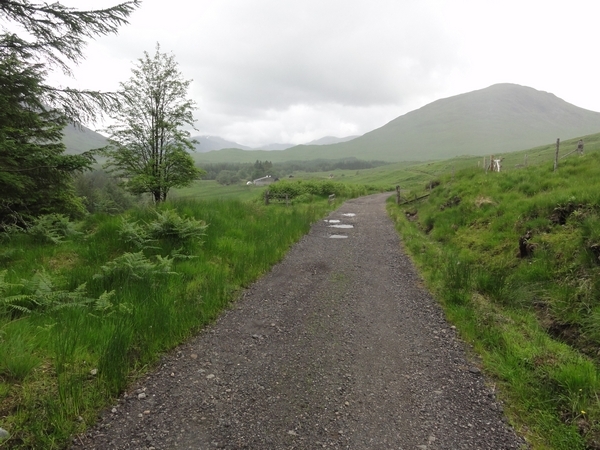 Cross the road onto the single track road and follow this round to Loch Tulla, the Inveronan Hotel and to Forest Lodge. 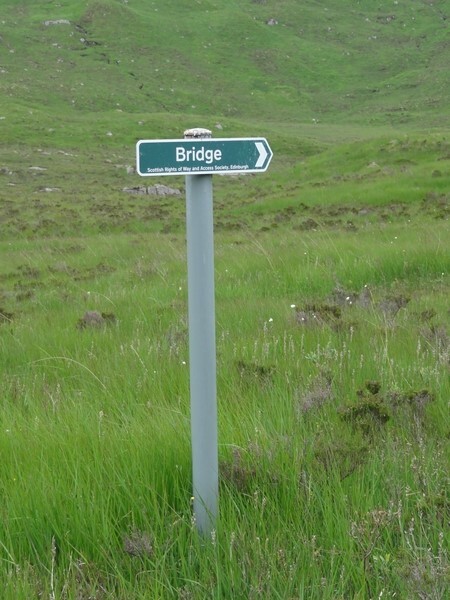 At this point, turn left, off the West Highland Way, and follow the sign for the public footpath to Loch Etive and Glen Kinglass. 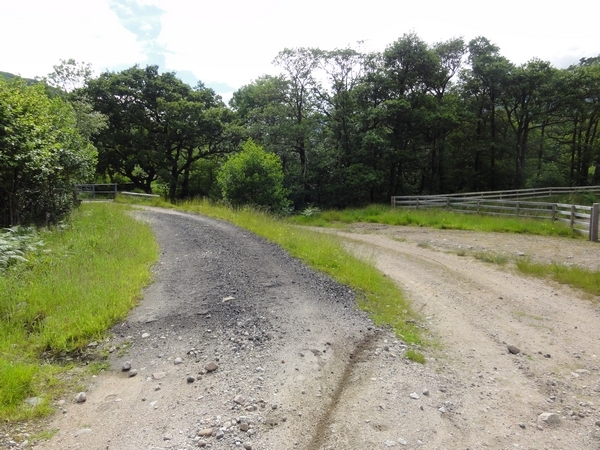 This takes you onto a landrover track and out into open moorland. 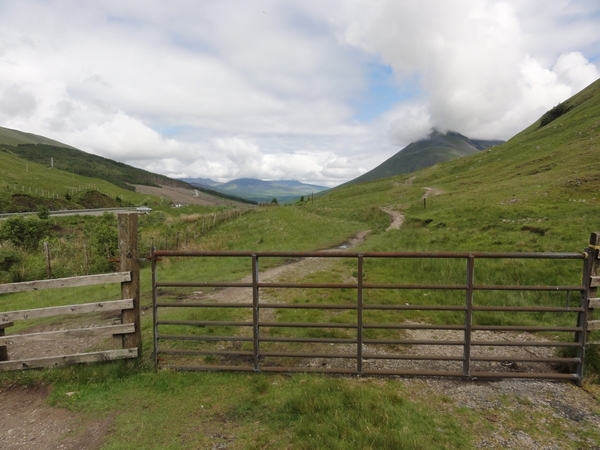 You will reach an open gate with a sign pointing to a path to the left of the fence/track. 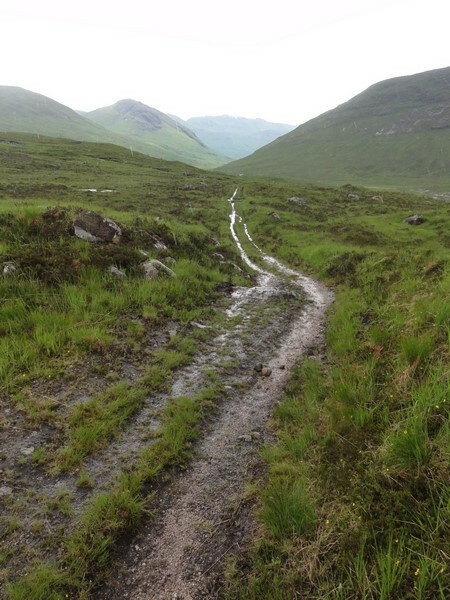 This route is very boggy in places, so it is easier to stick to the landrover track and continue to Clashgour farm. 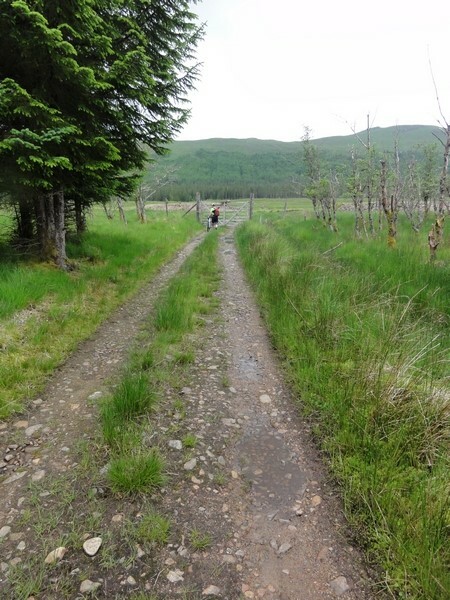 Continue through the farm and downhill back to the river. 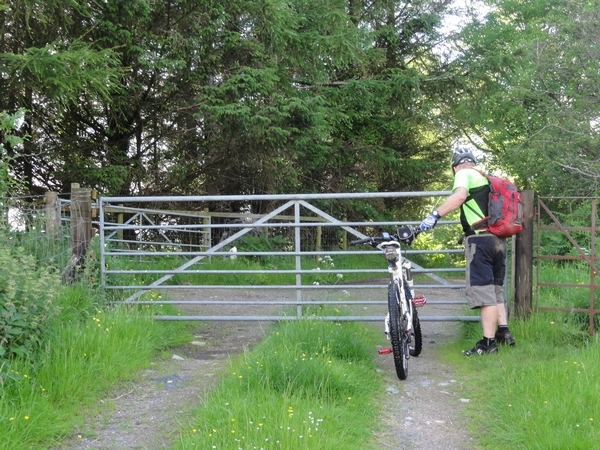 The only drawback with this route is the bikes have to be lifted over a high gate at the deer fence. 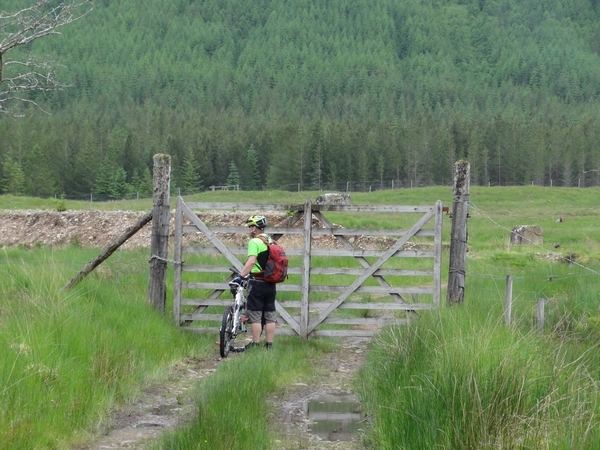 Once over the gate, the first over several water crossings have to be negotiated. 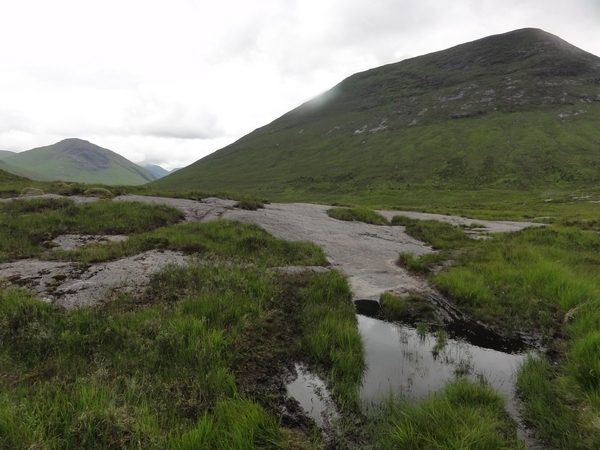 The first one is shallow and could be cycled across, but the stones are rounded and slippery, so it is easier to just walk across. 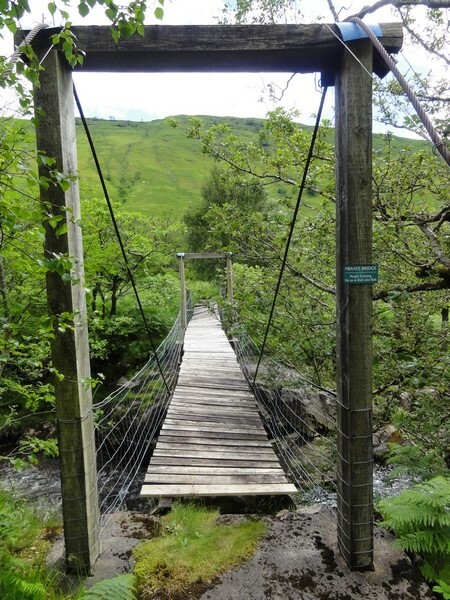 The second crossing is much deeper and you will have no choice but to get your feet wet. 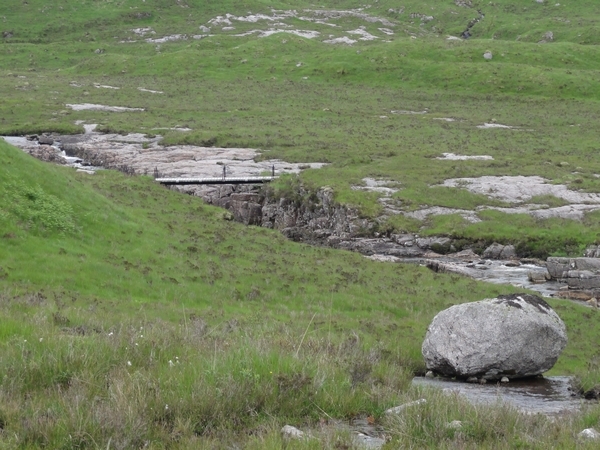 The third crossing is shallow and can be cycled across with care. 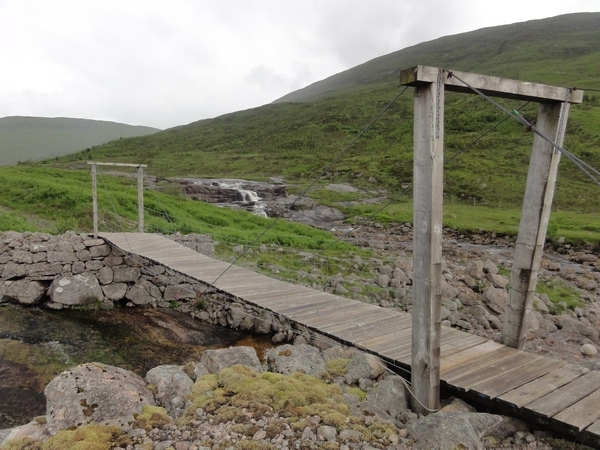 At this point you see a footbridge that allows you to cross the river and miss out the second and third water crossings. 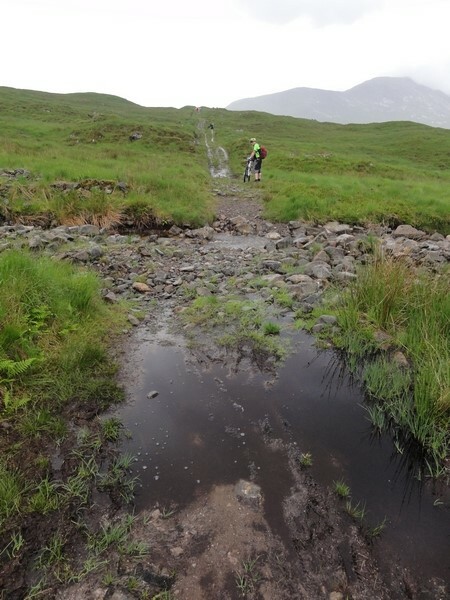 You will probably be every bit as wet choosing this option though, due to the boggy nature of the surrounding area. 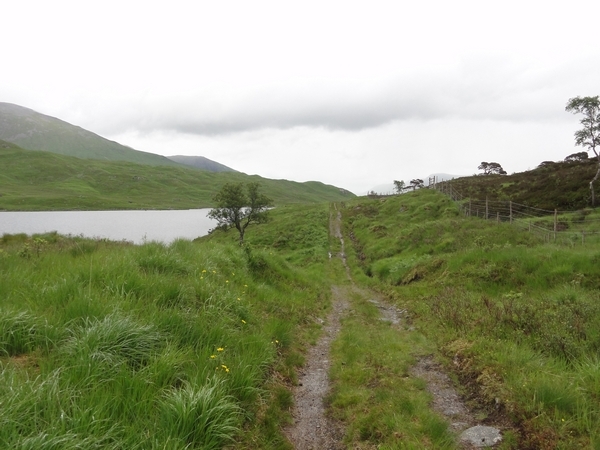 The landrover track then climbs, steeply at times, up to Loch Dochard. 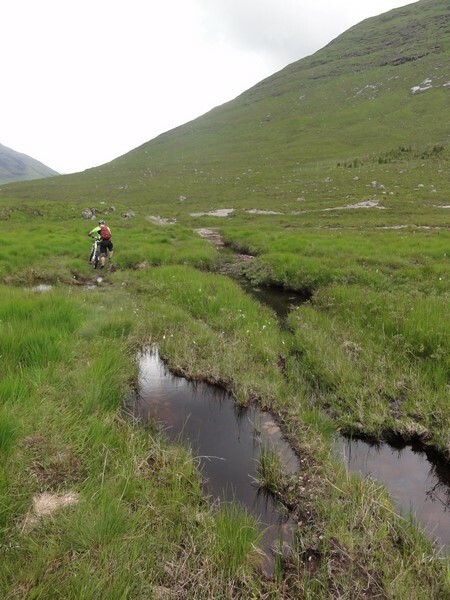 It is easier to get off and push as the track is quite rough in places due to water errosion. 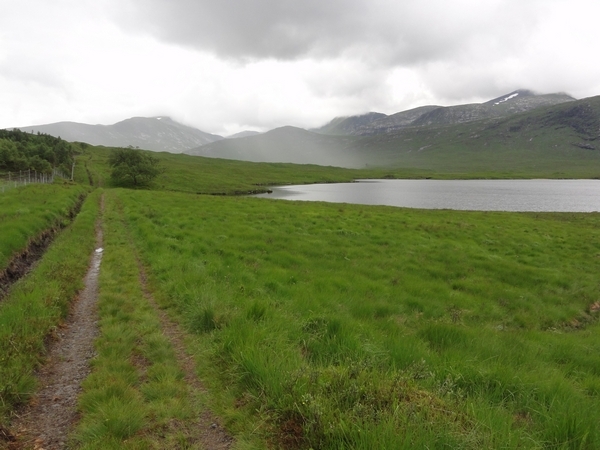 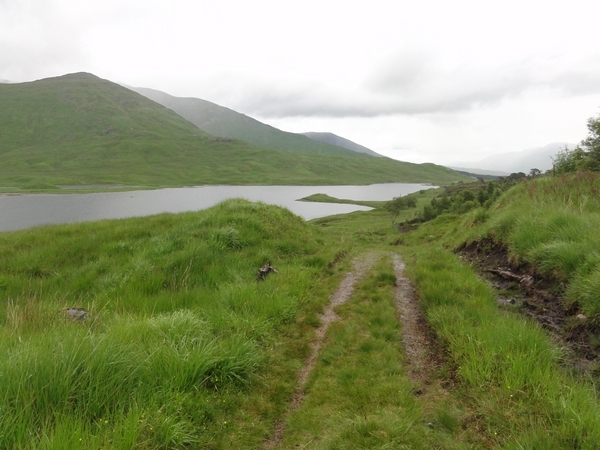 At Loch Dochard, the track levels off before beginning a more gentle climb up to the watershed and the head of Glen Kinglass, approximately 2 Hours from Bridge of Orchy. 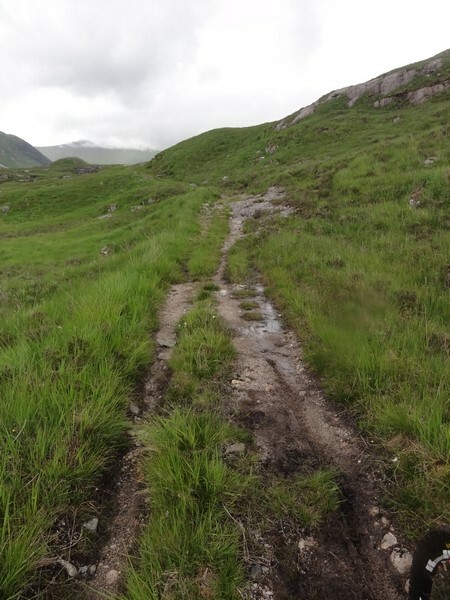 The track also becomes grassier and boggier, but progress in general is good, only a few rocky and boggy sections requiring you to get off. 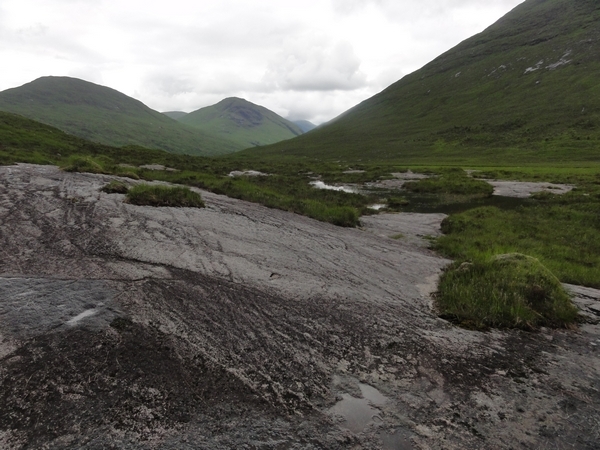 Starting the descent of Glen Kinglass, you come across moab type rocks. 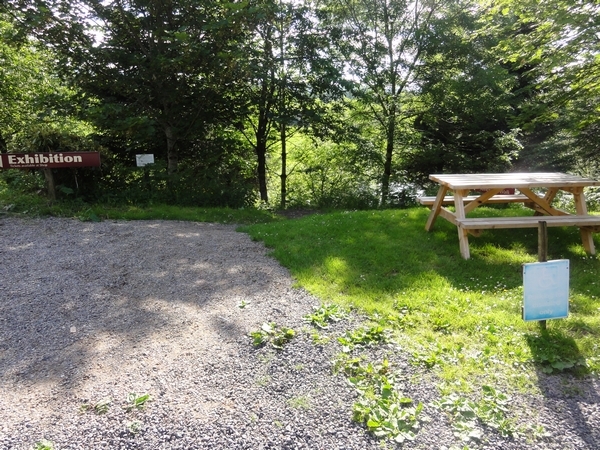 This a good place to have some lunch and admire the scenery, as in wet weather, it will be one of the few dryer areas about to sit down. 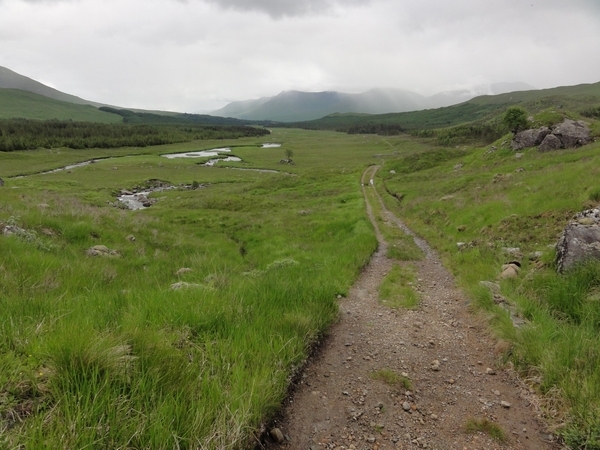 The natural way forward from here is to follow the faint landrover track down towards the River Kinglass, negotiating a small water crossing before navigating the wider river crossing itself. 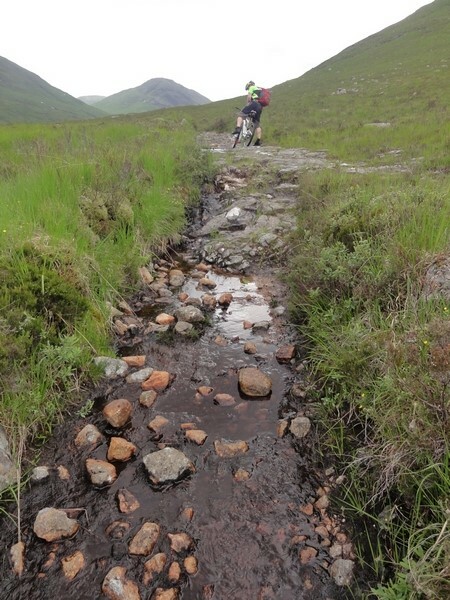 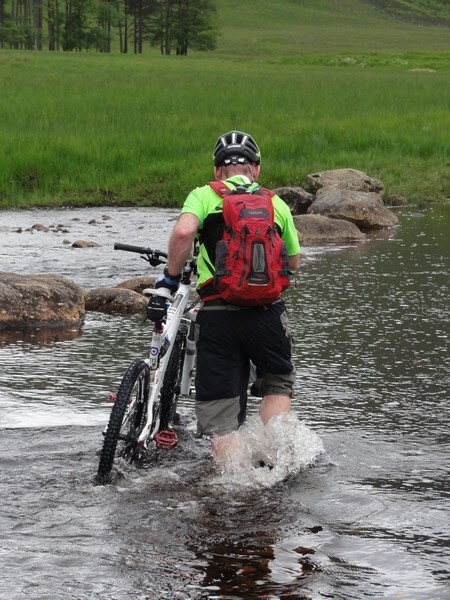 The track climbs from the river crossing, but is rocky and slippery when wet, so some pushing is required. 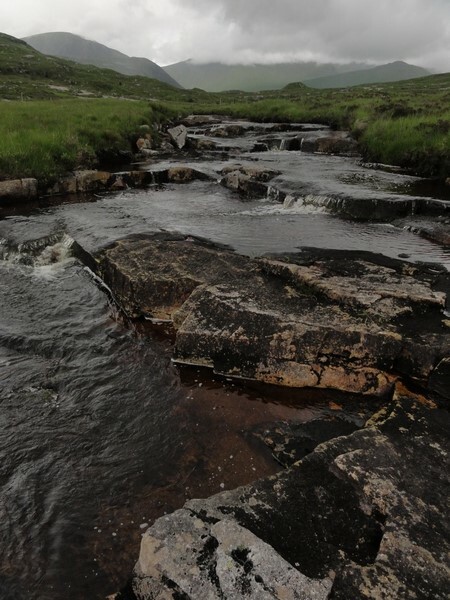 Not shown on the map, there is a path that takes you down to a footbridge, unseen from the moab type rocks, which takes you across the River Kinglass a few hundred meters downstream from the wider river crossing. 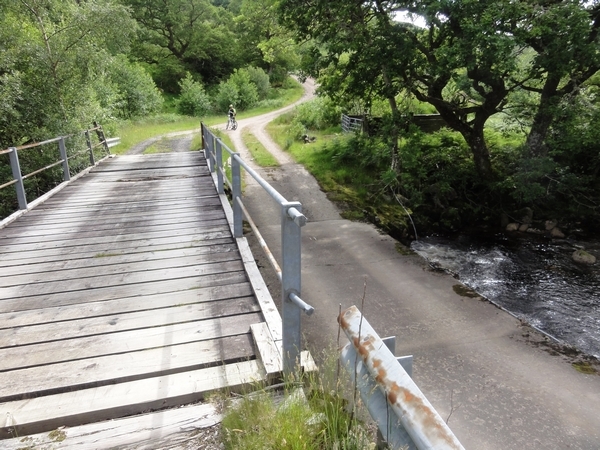 The first hint of the bridge is the reverse side of a sign pointing downhill from the track towards the river, which you see over your left shoulder as you face down Glen Kinglass. 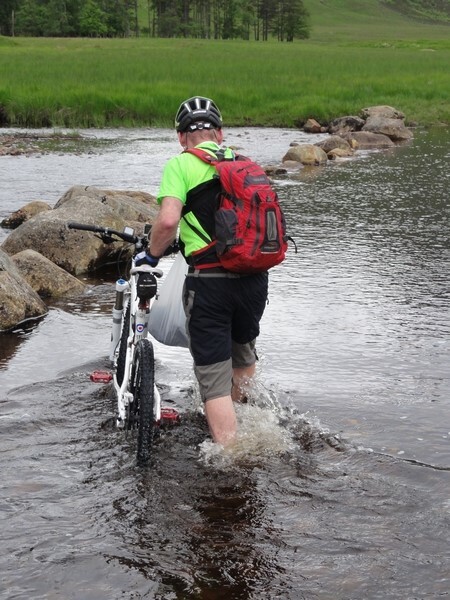 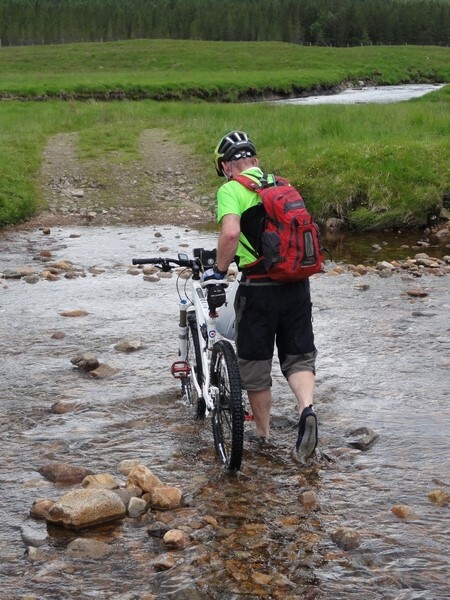 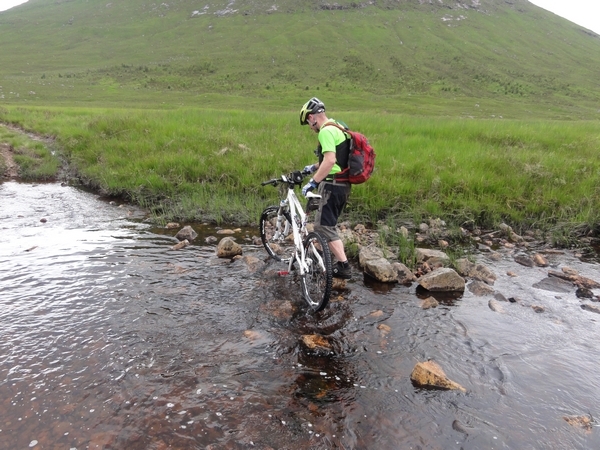 You then realise you could have had a much easier river crossing. 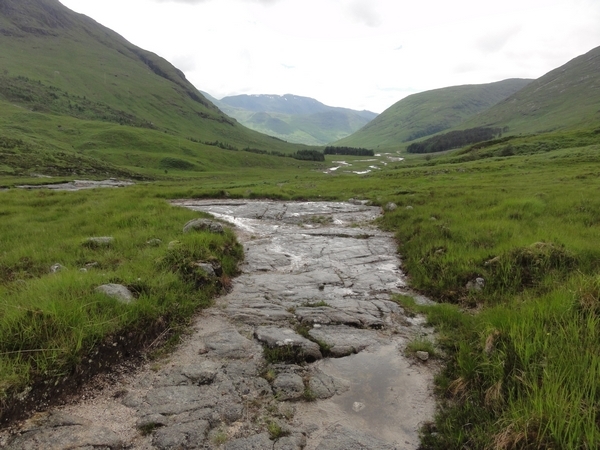 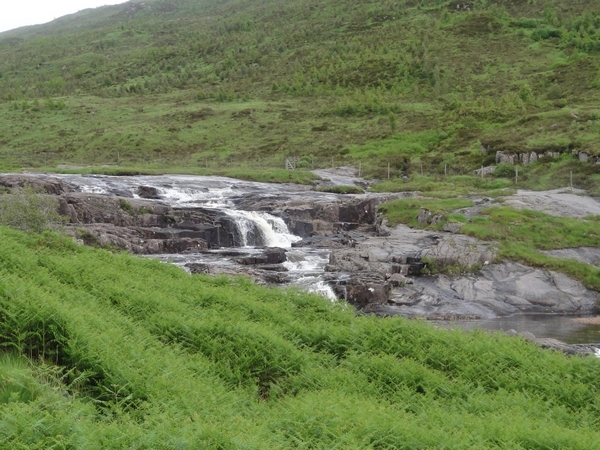 The landrover track continues its descent down Glen Kinglass, gradually losing height as it runs parallel to the river with its numerous waterfalls, as it too, decends Glen Kinglass. 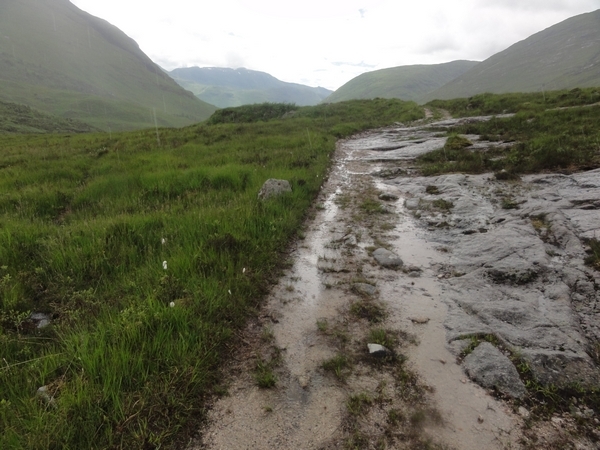 Progress is good, only hampered by slippery rocky sections, some moab type, others more like cobbles. 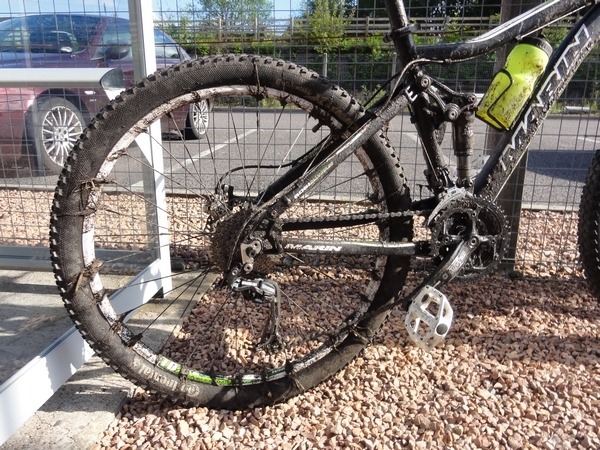 In the dry, these won't be an issue. 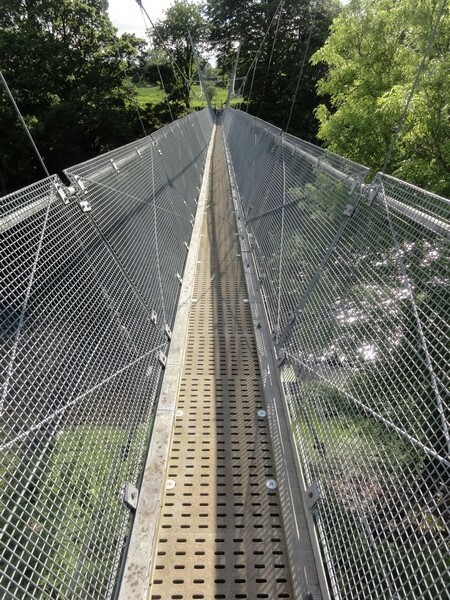 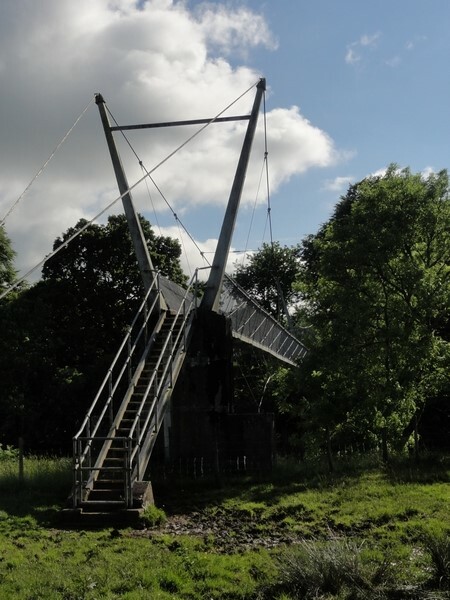 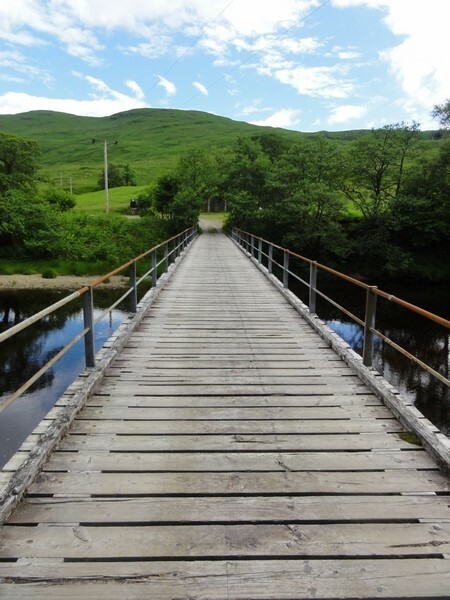 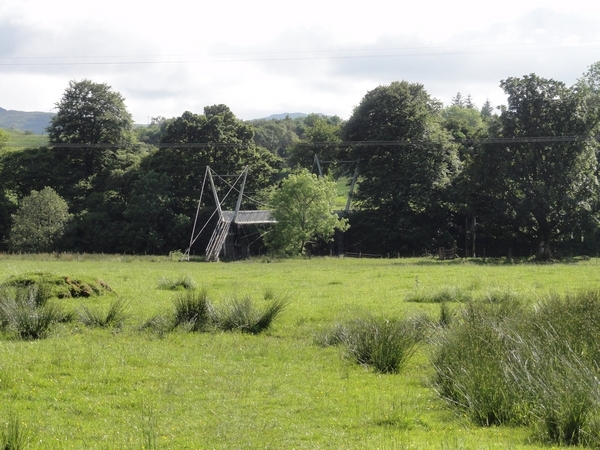 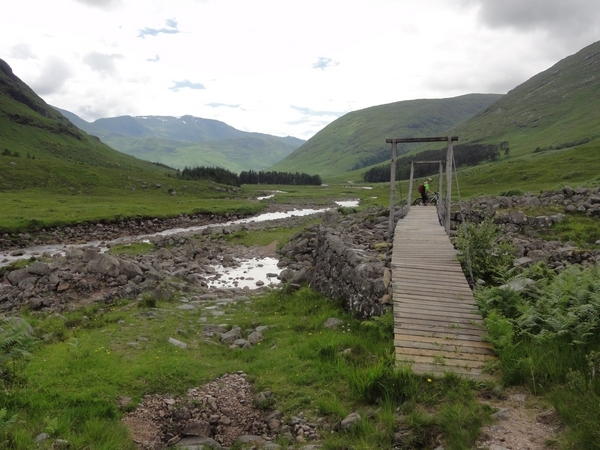 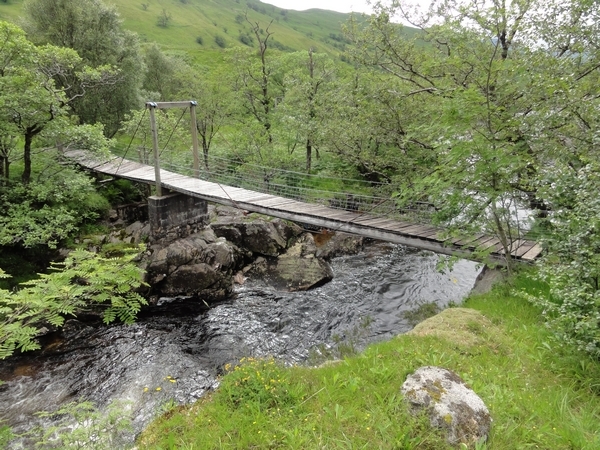 A rickety suspension bridge crossing allows an easy water crossing and before not too long, Glen Kinglass Lodge appears. 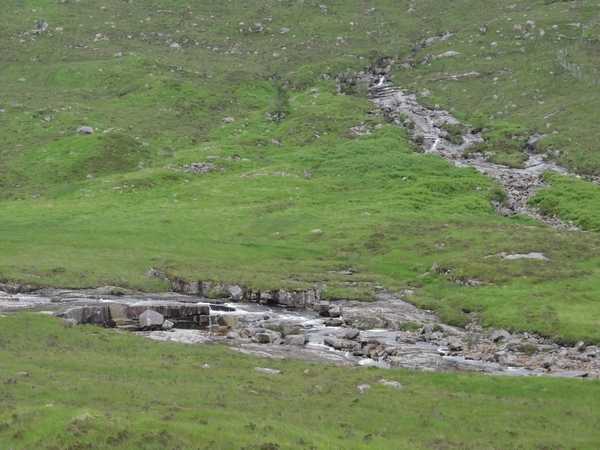 At this point, the landrover track improves and climbs away from the river. 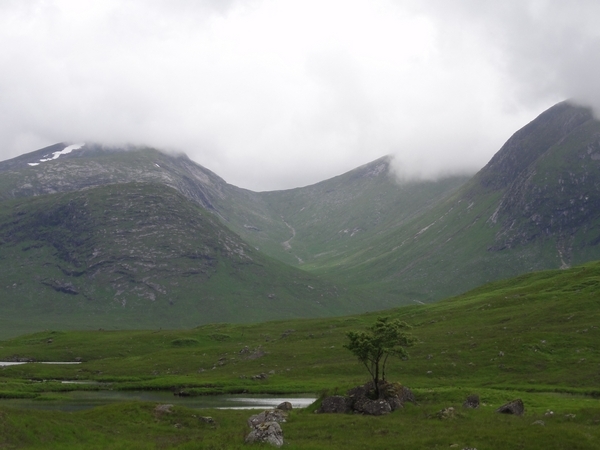 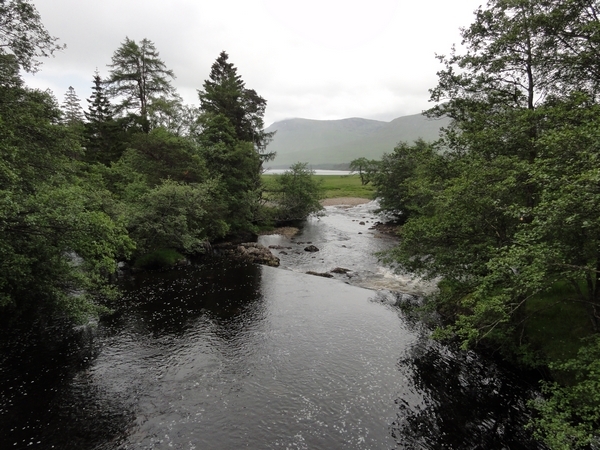 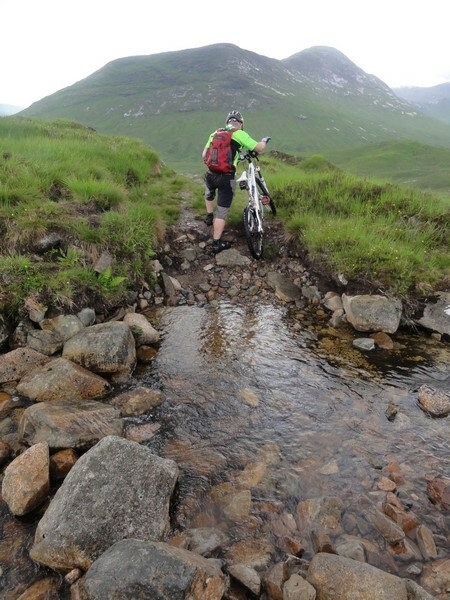 It gently climbs and descends before ultimately descending back down to the River as you approach Loch Etive. 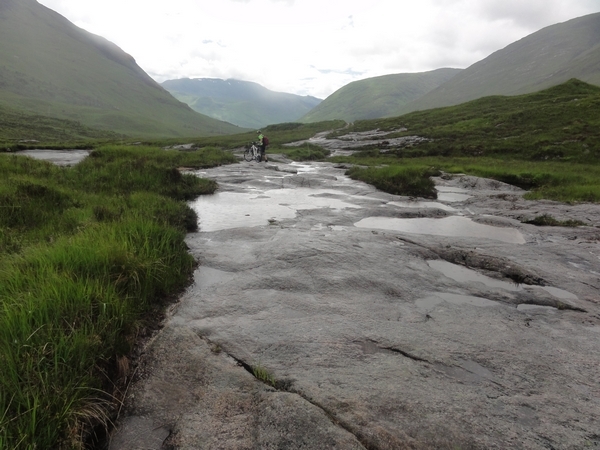 From the moab type rocks, it takes about 1 Hour 30 Min to descend Glen Kinglass. 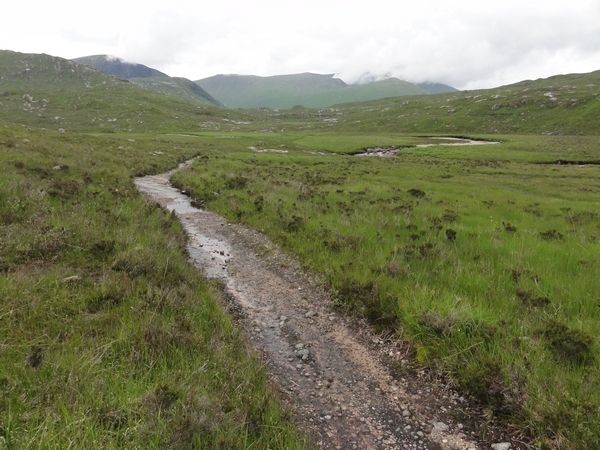 Nearing Loch Etive, you come to a T-junction, where you turn left to cross the River Kinglass and follow landrover track as it undulates along the side of Loch Etive. 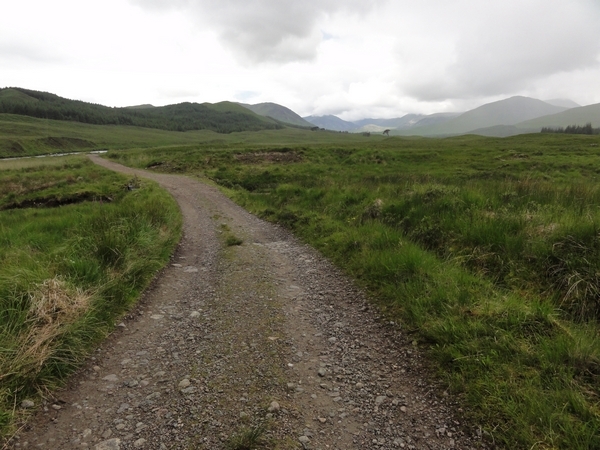 To say the track undulates is an understatement. 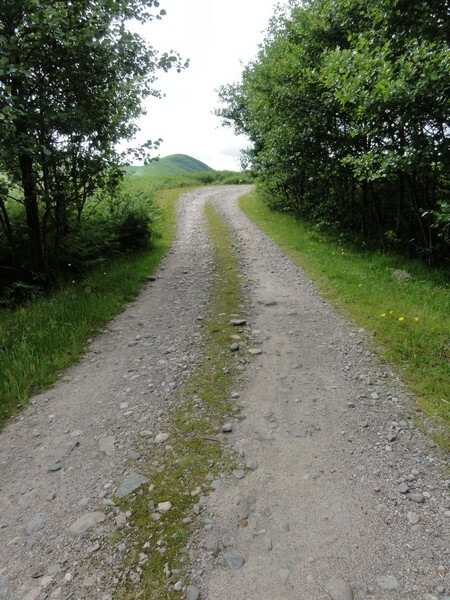 This is where all the hard work really begins and where you lose all your time. 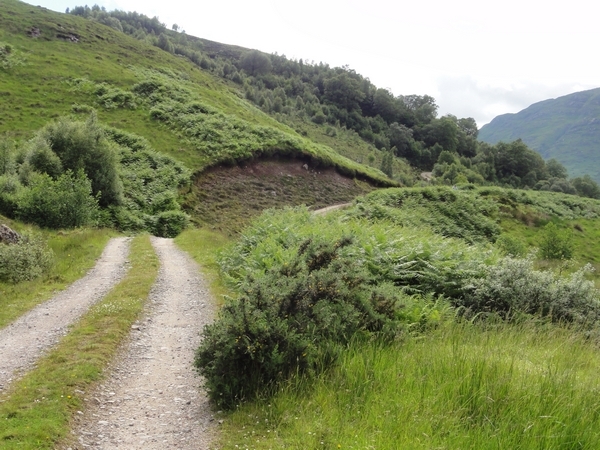 The track climbs and descends steeply. 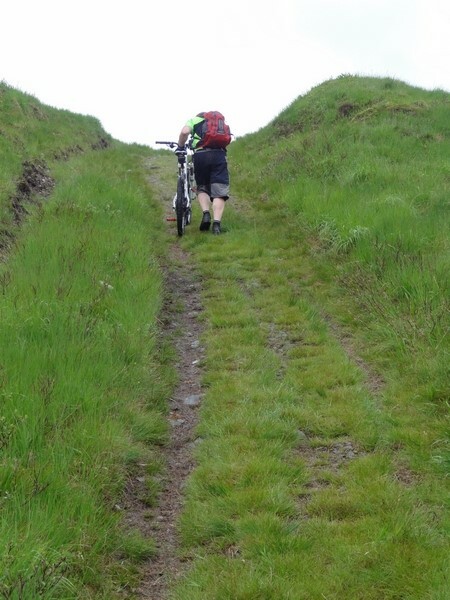 The climbs are so steep in places, it is easier to get off and push. 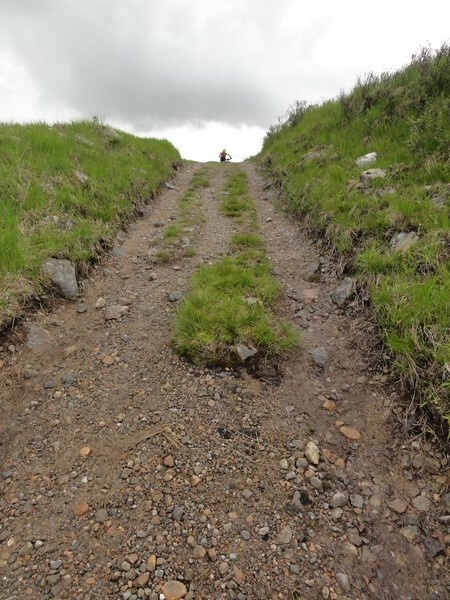 You also have to watch your speed on the descents due to the loose surface and sometimes twisty nature of the track. 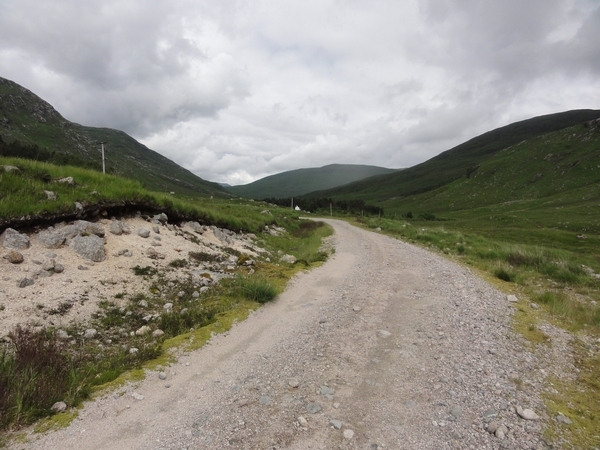 Strangely, some parts of the track are tarmac, but this doesn't make progress any easier. 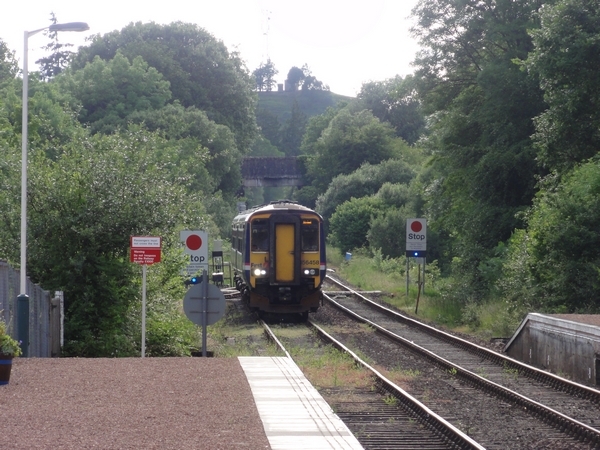 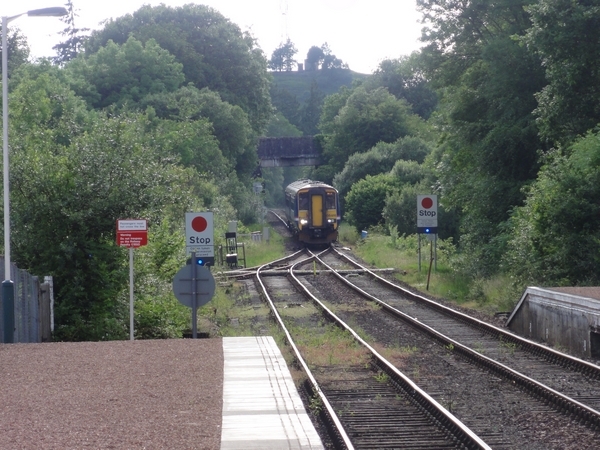 This part of the route seems never ending and you start to think you will never make it in time for the train. 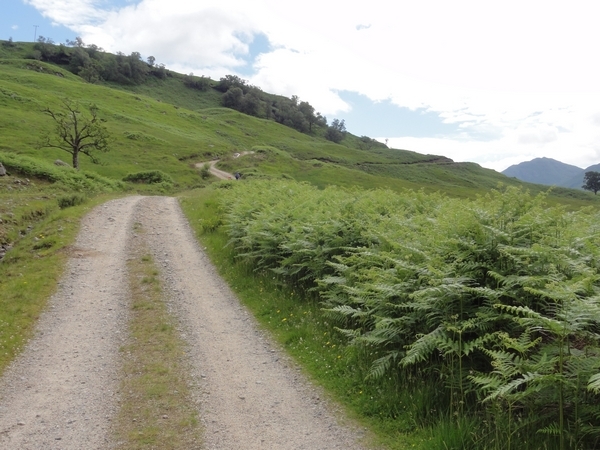 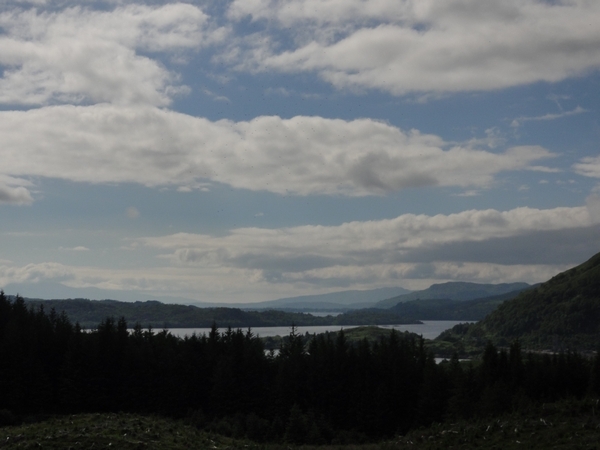 Eventually you head away from the Loch and head through some forestry before descending down towards Inverawe. 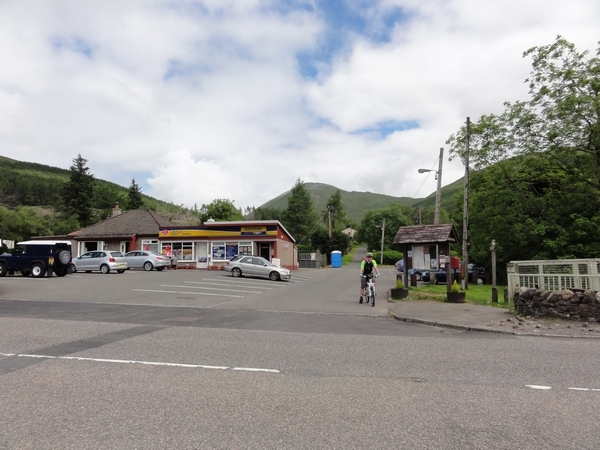 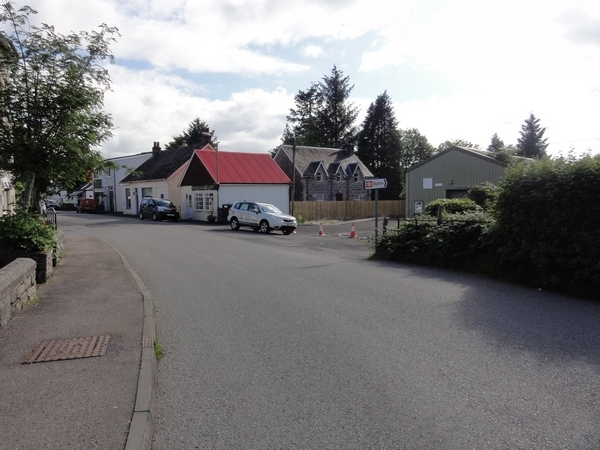 After what seems an eternity, but is actually just 1 Hour 30 Min, as you leave the forest you reach a road junction, where you turn right and head round to Inverawe Smokery. 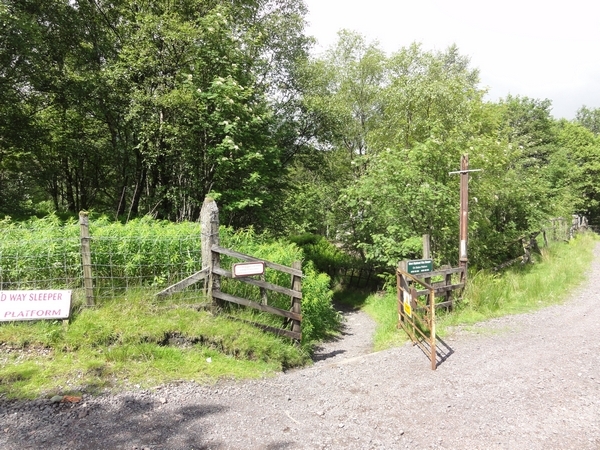 To the right of the Smokery Shop and to the right of the sign, take the hidden footpath down to the fields and head towards the footbridge over the River Awe. 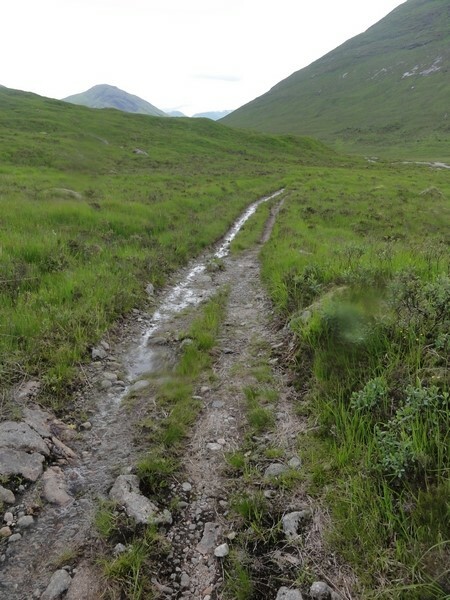 Choose your line carefully, as there are boggy sections in the field which can catch you out. 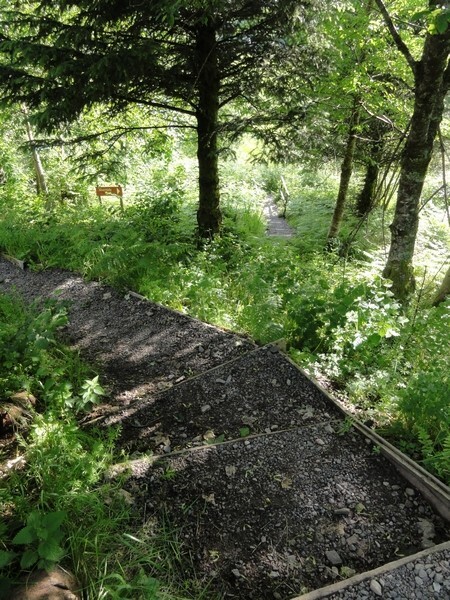 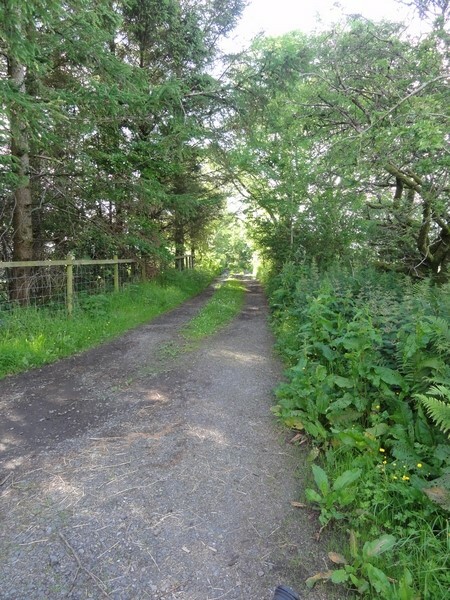 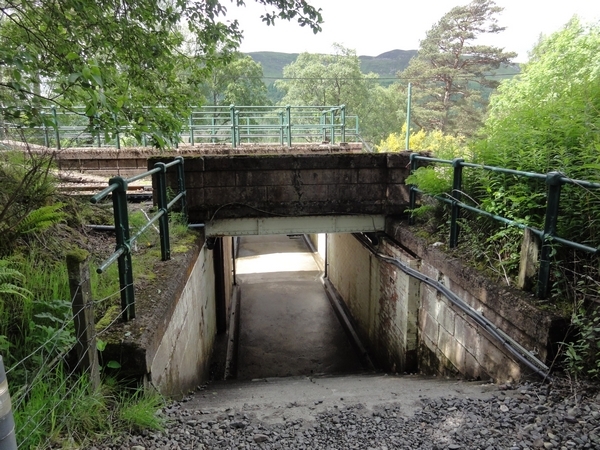 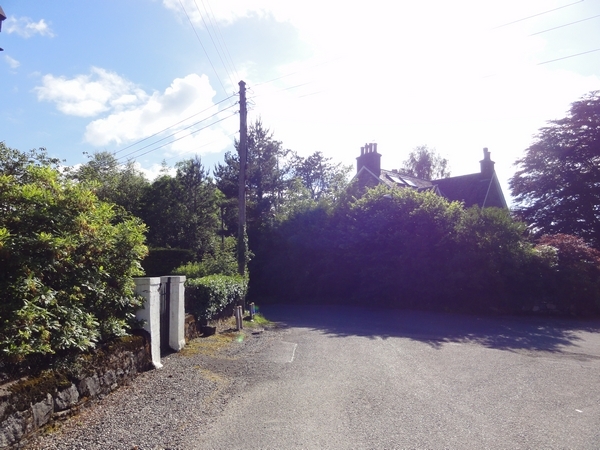 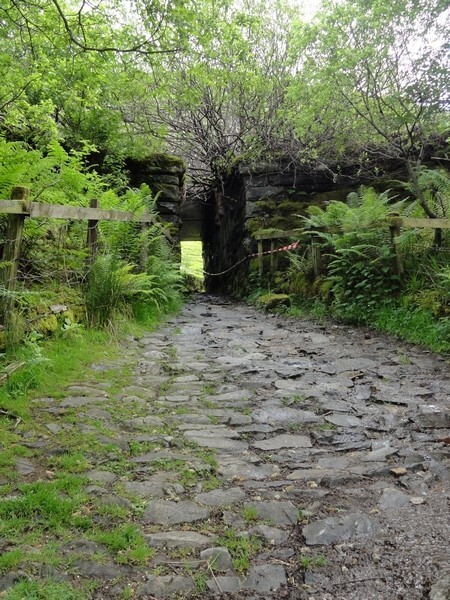 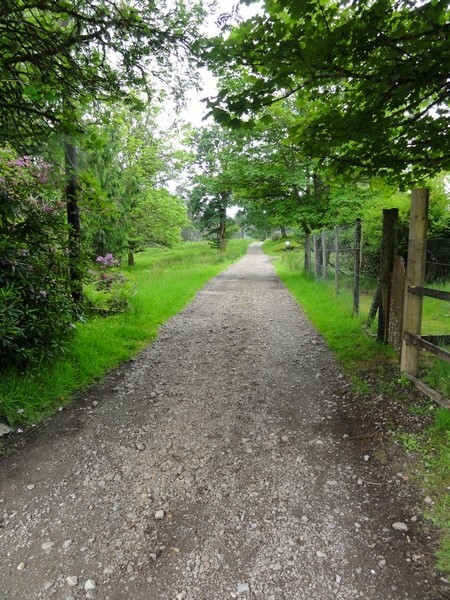 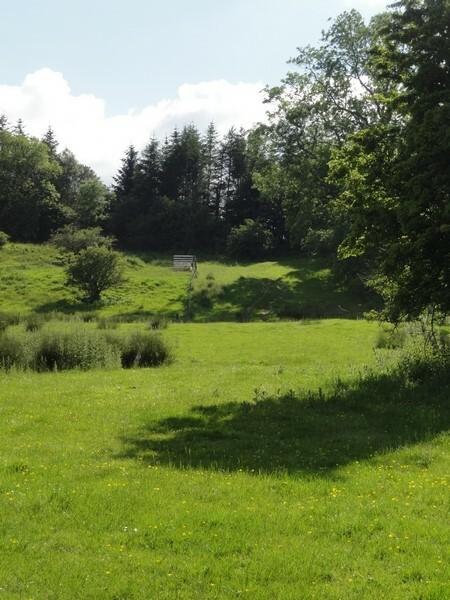 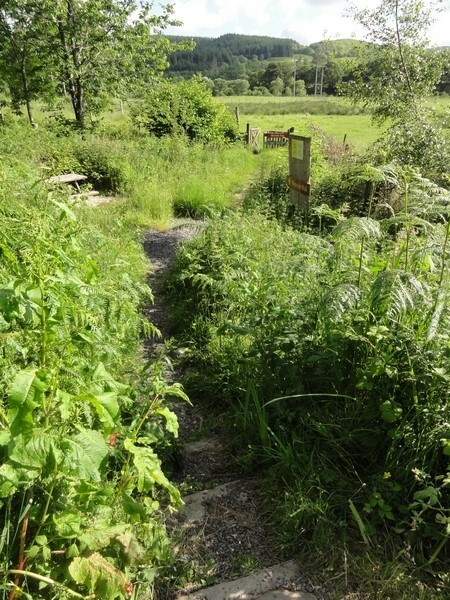 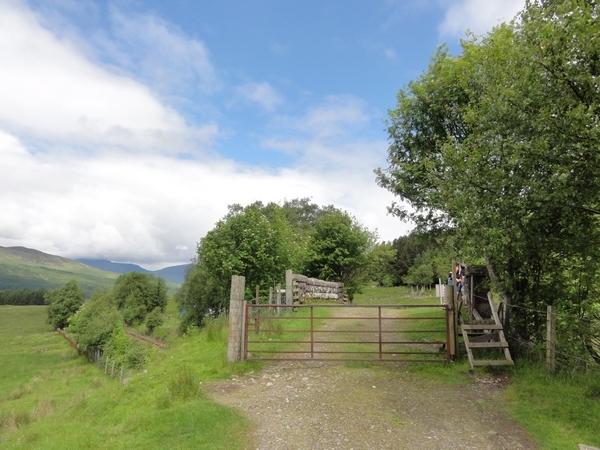 Once over the bridge, take the track up the hill towards the trees and through the gate, where you turn right and follow the track past Bonawe Furnace and into Taynuilt. 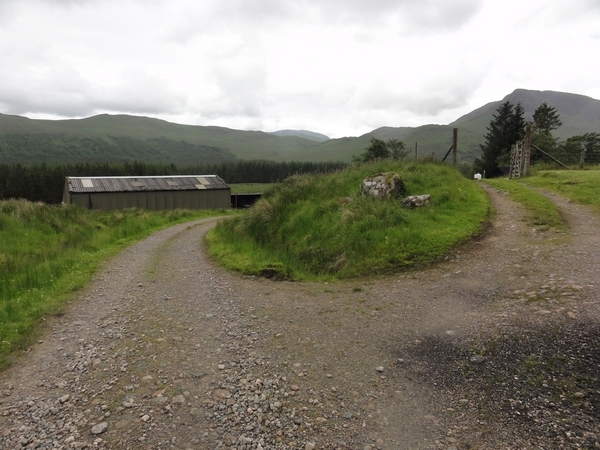 Turn left and head down the hill. 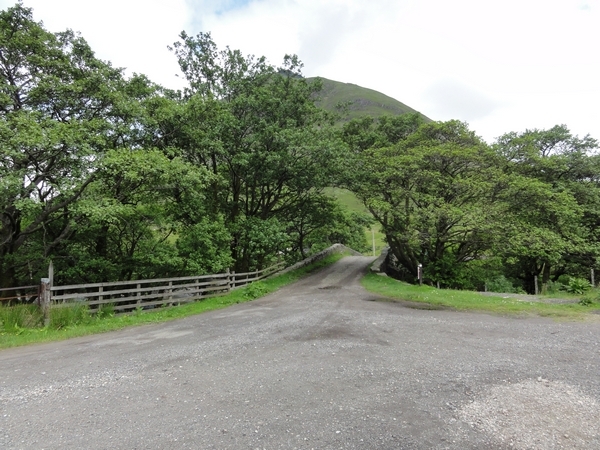 At the junction, turn right and follow the road round, over the bridge before one final climb up towards the railway station. 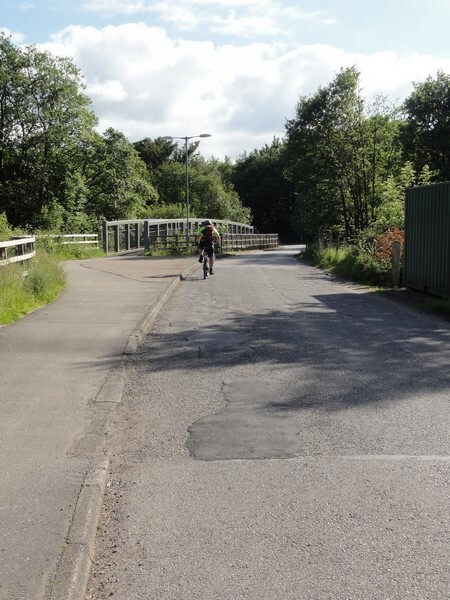 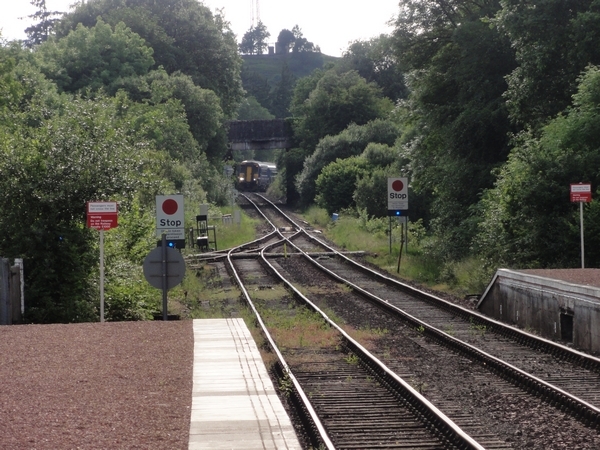 Cross the railway bridge and take the road on the right, as you double back on yourself and descend towards the station. 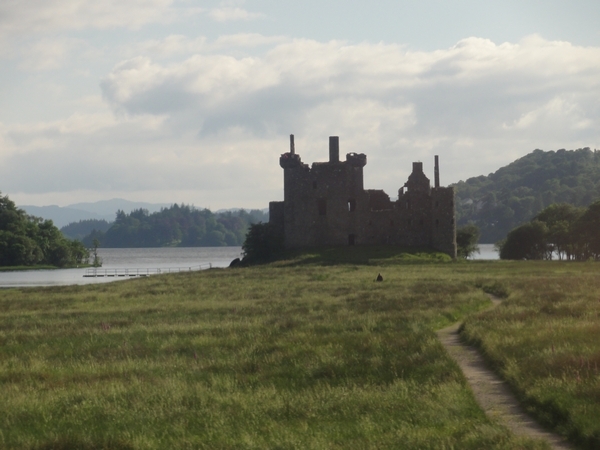 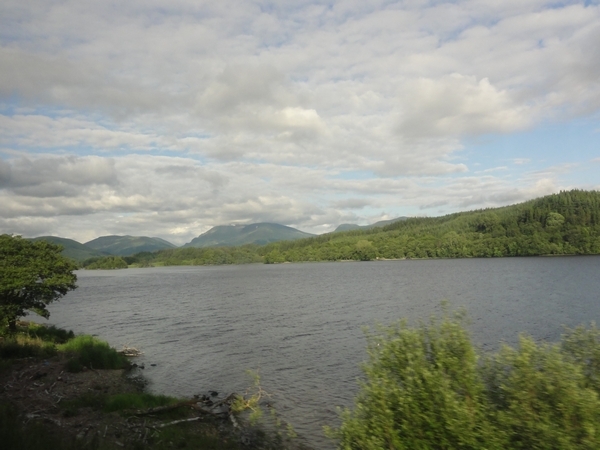 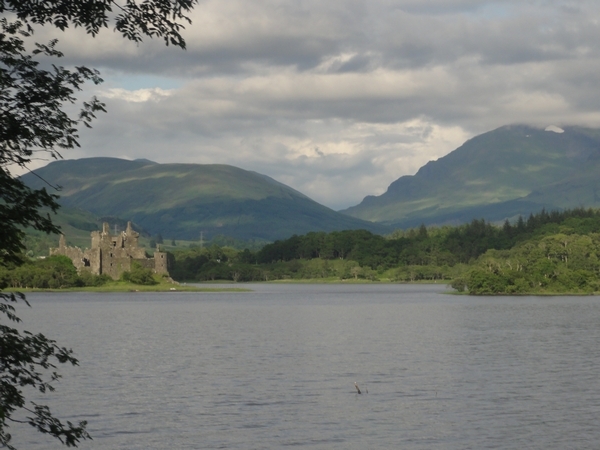 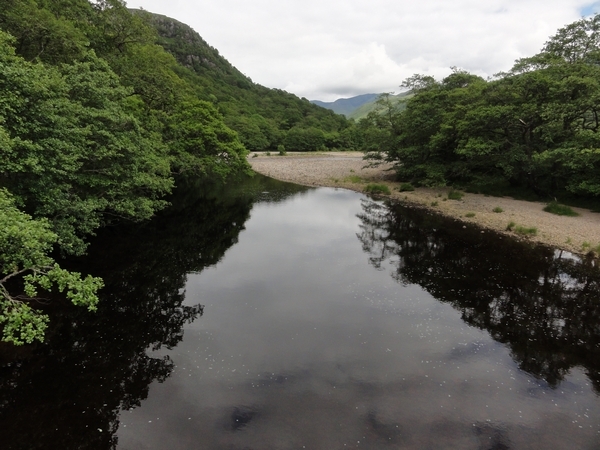 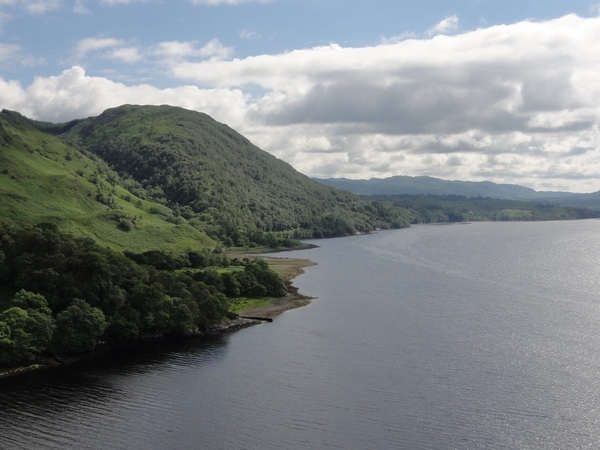 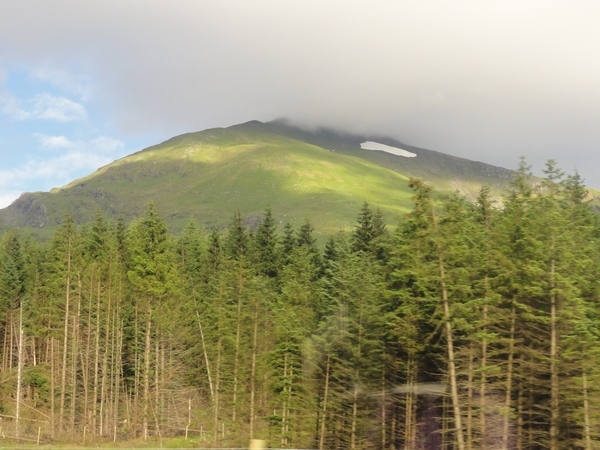 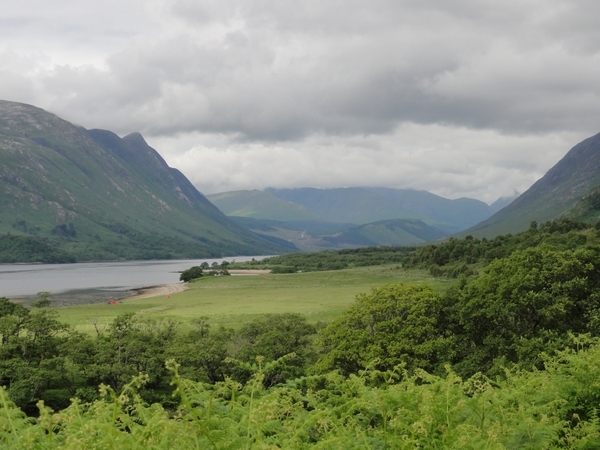 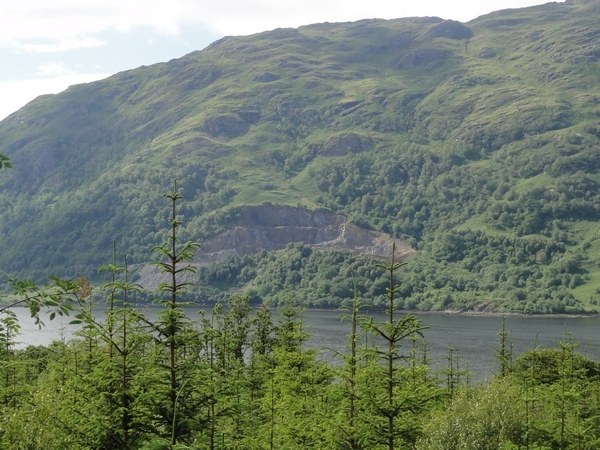 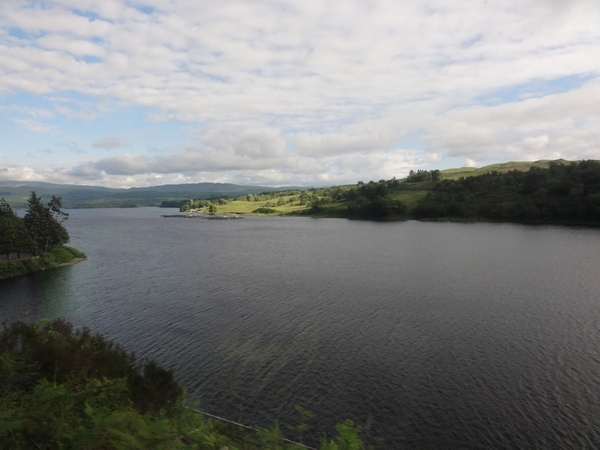 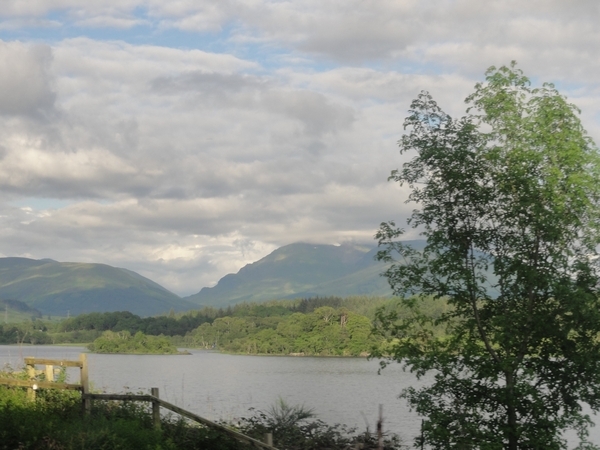 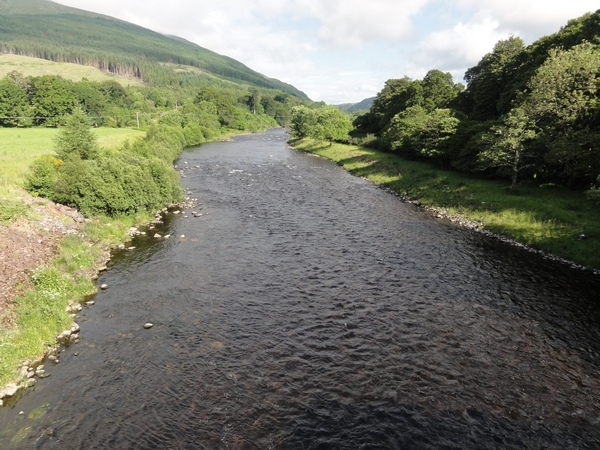 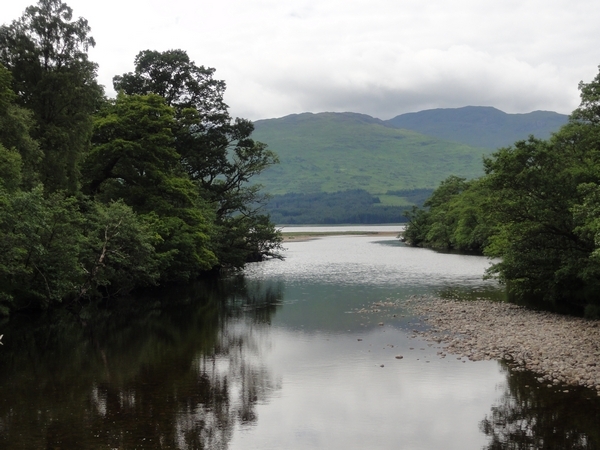 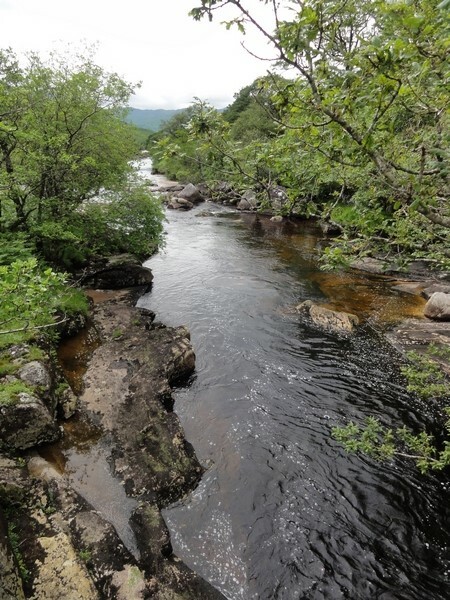 The train journey back to Tyndrum allows you to relax and enjoy the scenery as you follow the shores of Loch Awe, passing Kilchurn Castle before heading up Glen Lochy and back to Tyndrum Lower station. 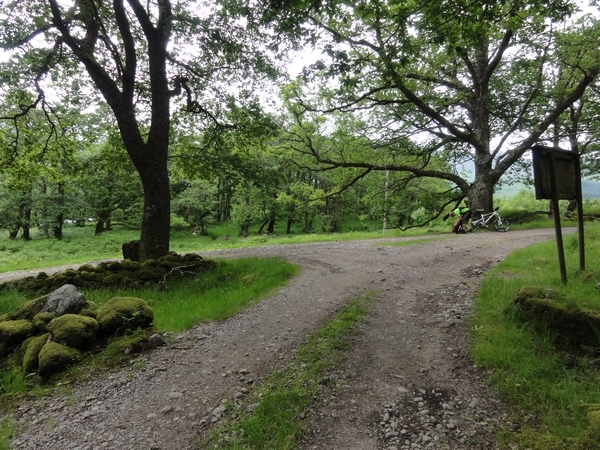 From there, it is a short bike ride to the main road, where you turn left and the Green Welly is only a few hundred meters ahead on the right.